Online Contests and Giveaways are a great way to build reputation for your brand and at the same time scoring leads in form of participants. If your contest goes viral, you can imagine a stream of brand signals and leads coming your way. Creating a contest and putting a worthy prize / reward behind it is one part of the whole contest. But if you can’t promote your contest, you might not be able to bring in that many participants. 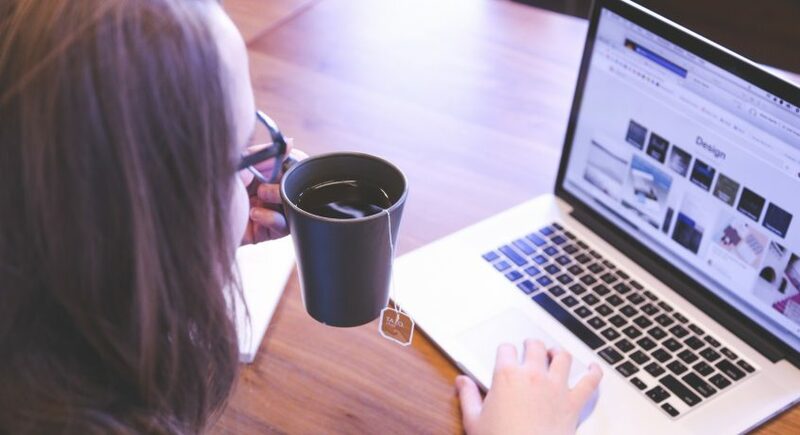 If you’re looking for a way to further promote your contest beyond your current lists and followers, sharing your contest on popular sweepstakes, giveaways and contests websites will help. 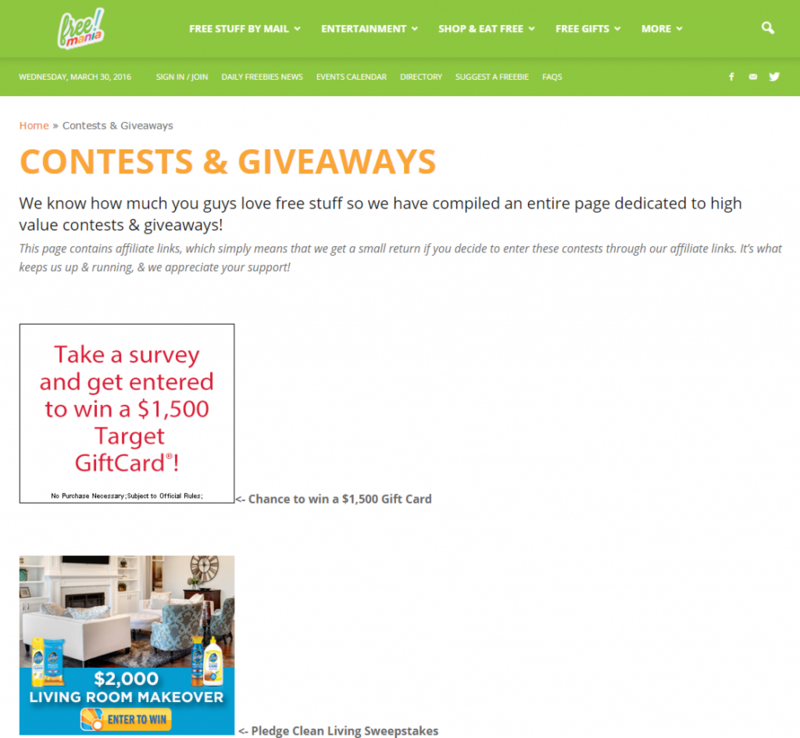 Contest websites features contests from around the internet and cater thousands of users per day who love to enter and share contests with their friends and family. Tapping these users will help you bring in hundreds of more contest entrants from untapped locations. That’s why we have collected a list of Top 100 Online Contests and Giveaway websites where you can enlist your contests and giveaways. Listing your contest on these websites will help you improve traffic and a continuous stream of new participants for your contest. 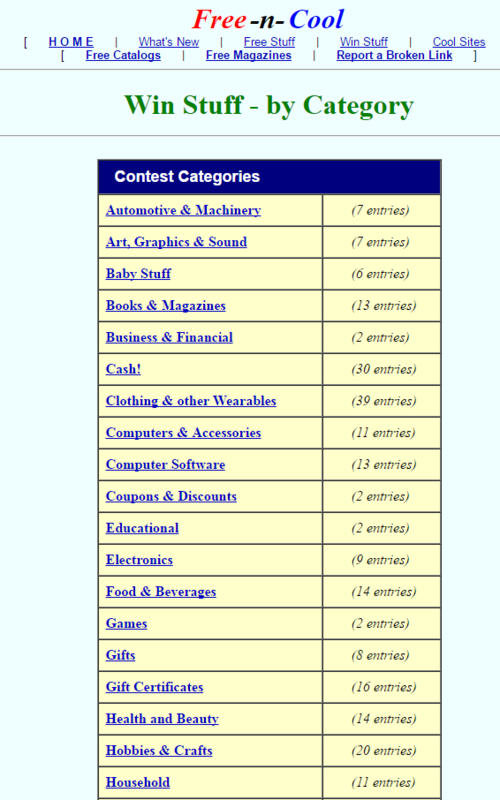 The Contest Girl is a very old website (started in 2006) that features sweepstakes and contests listing from US and Canada. 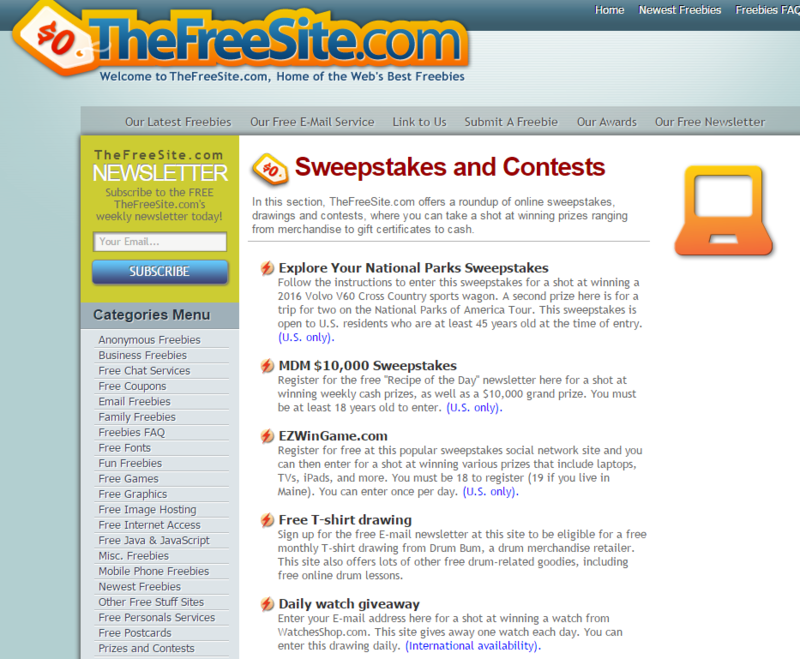 FreakyFreddies.com is one of the most popular online contests sites on the internet. It regularly adds new contest and giveaways from around the web. 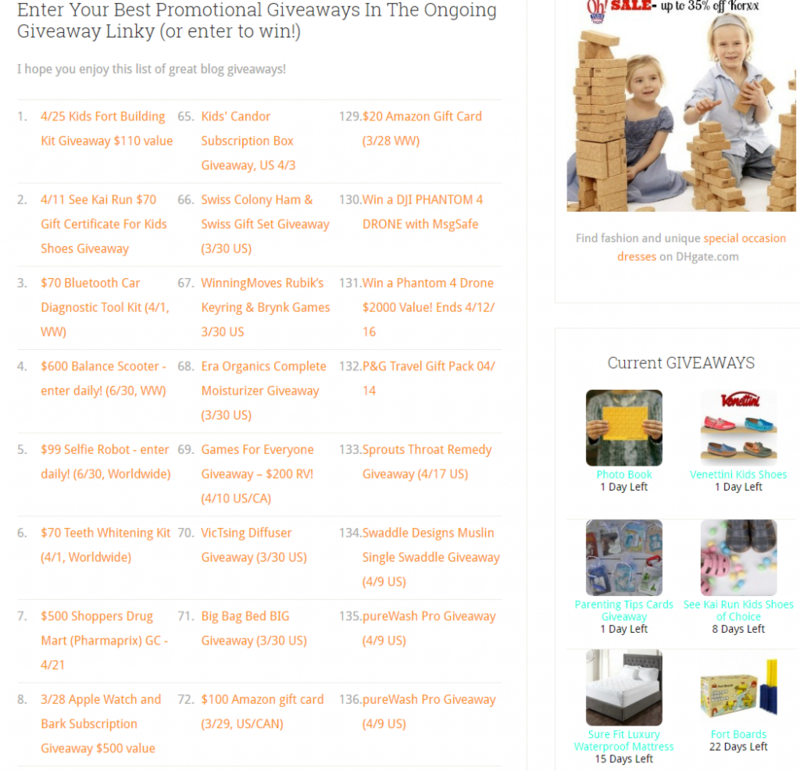 Giveaway Frenzy is a leading giveaway directory featuring giveaways, contests and sweepstakes of trending products and popular gift cards from businesses, brands and blogs. They also submit these to 120+ different contest sites. 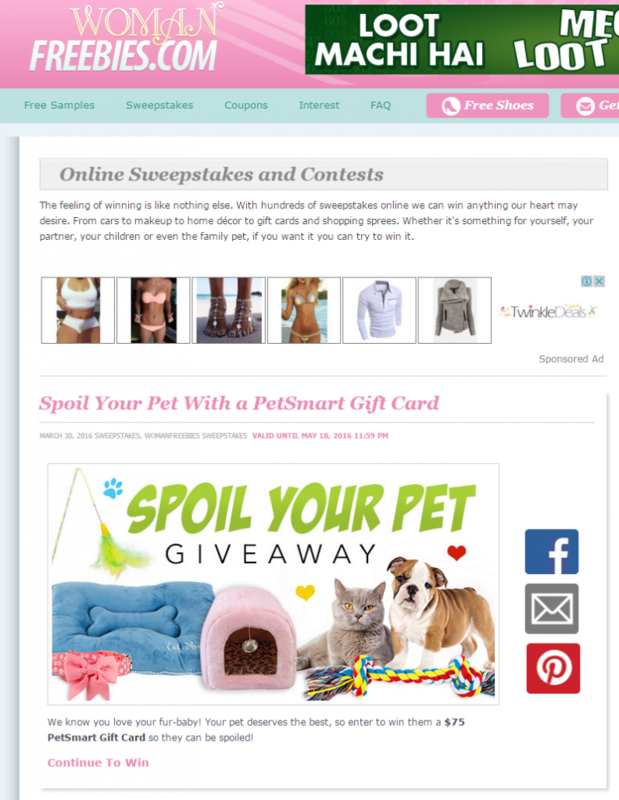 Sweeties Secret Sweeps is the place to register your both national (US) and local sweepstakes. 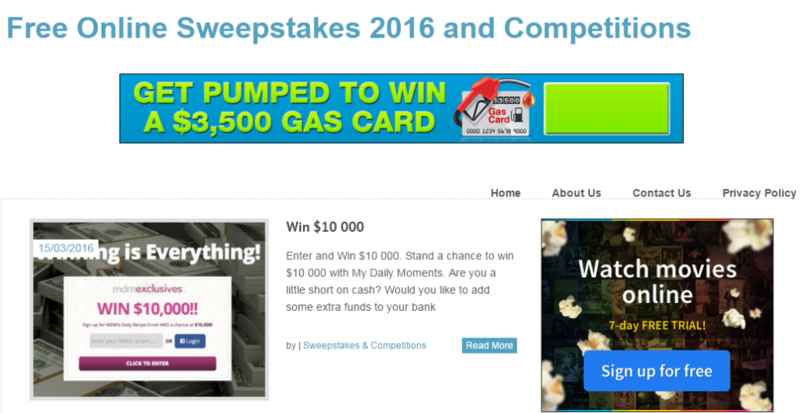 Sweepstakes Crazy is one of the oldest website that lists down online contests and sweepstakes. 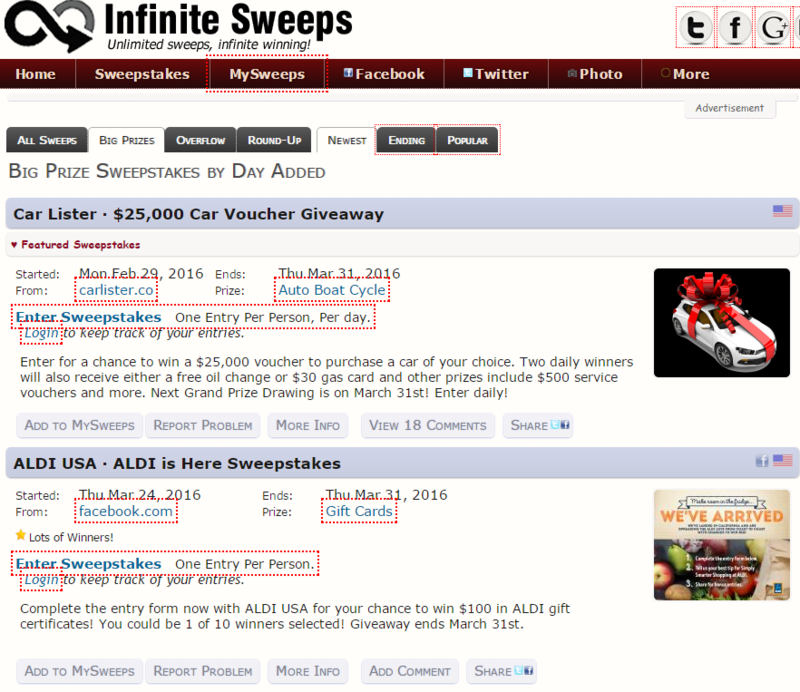 Infinite Sweeps , as the name suggest, is a huge and popular directory of online contests, sweepstakes and giveaways. 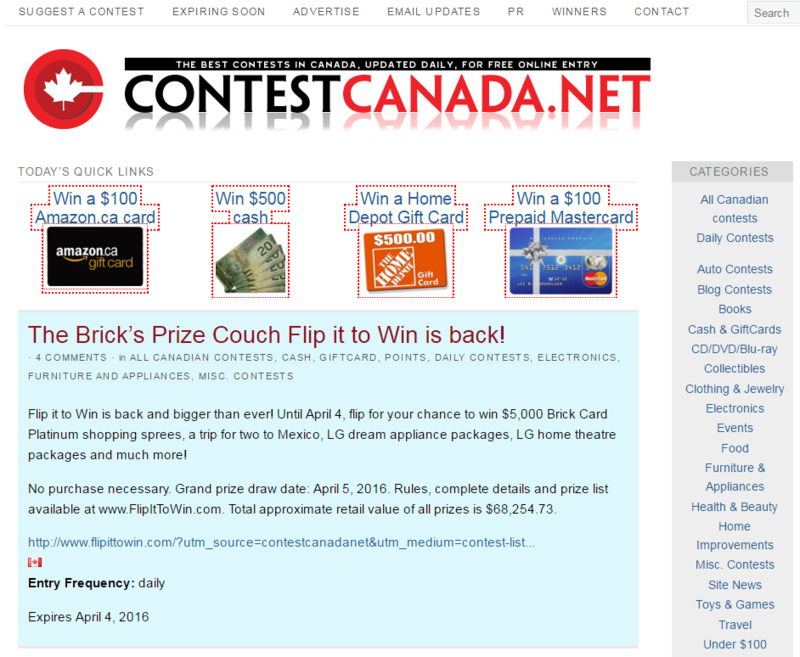 If your contest targeting is for US / Canada, you must submit your contest here. 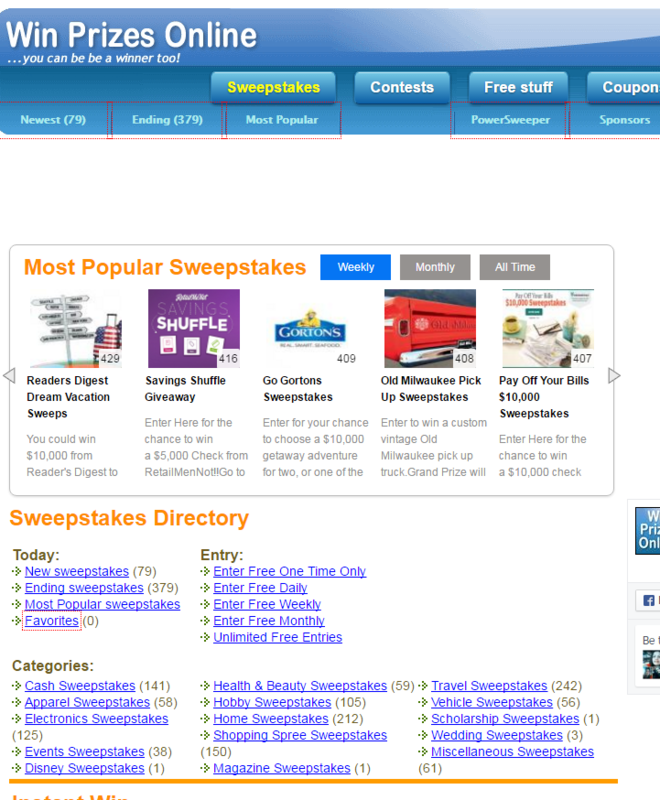 Sweepstakes Bug feature a daily updated collection of latest online sweepstakes from around the web. It take submission from all types of contests, giveaways and sweepstakes. 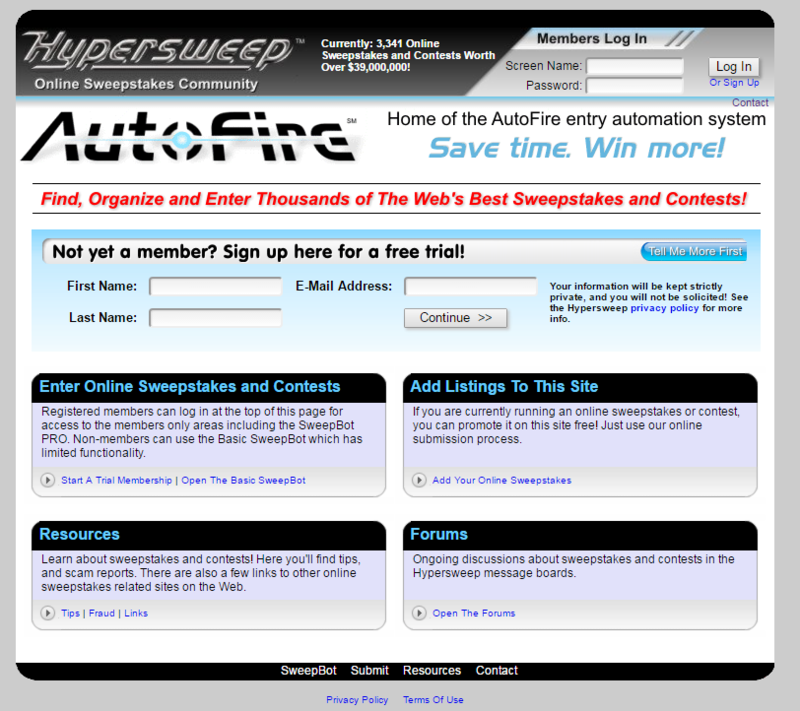 Hypersweep is a popular online contest and sweepstakes visited by thousands of people daily. Although the name suggest it will feature contests for Mom’s only, which they mainly do, Contest for Mom is popular website for finding all types of contests and giveaways. Win Prizes Online is a sweepstakes, contests, giveaways and deals aggregator with an interactive community identifying the highest quality offers. It is a very established website and has strong social media following. 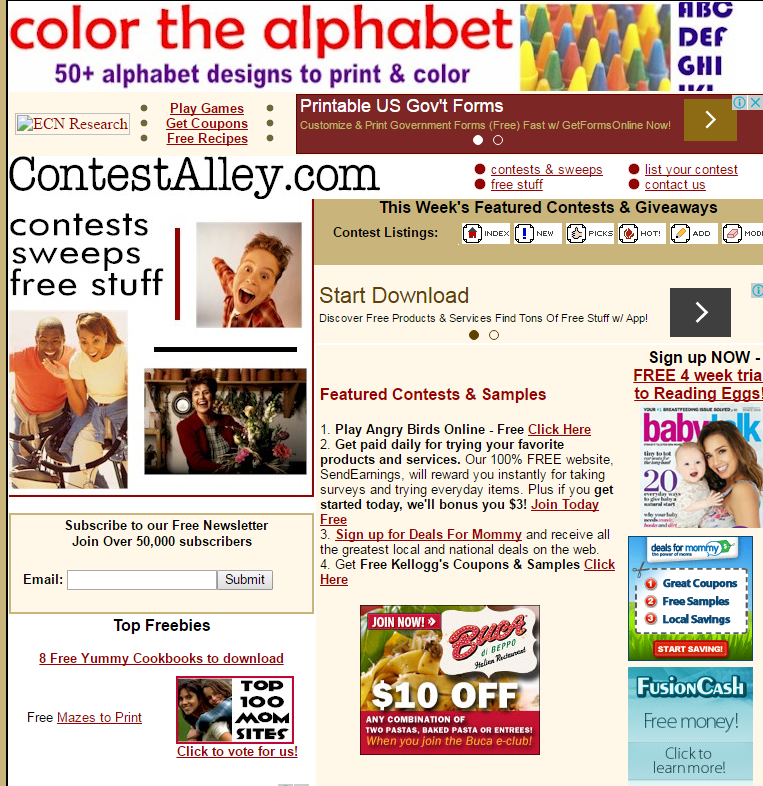 Contest Alley is also a very old and renowned website visited by thousands of people looking to participate in online contests and giveaways. 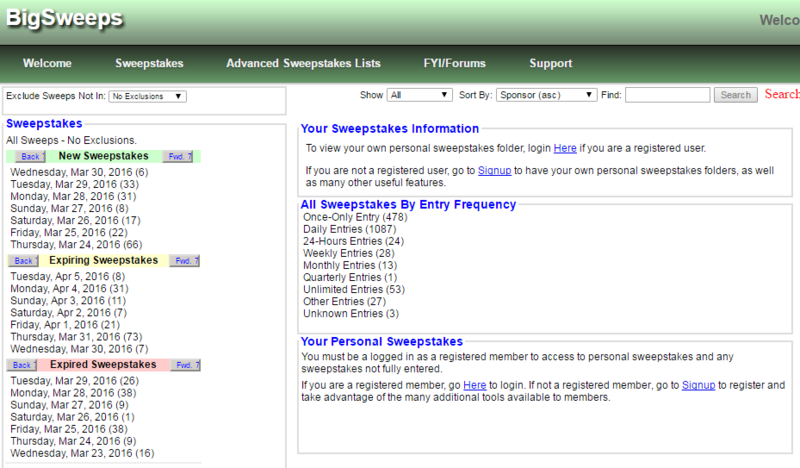 MySavings is home to one of the largest collection of online contests and sweepstakes. You can’t miss out adding your contest here. 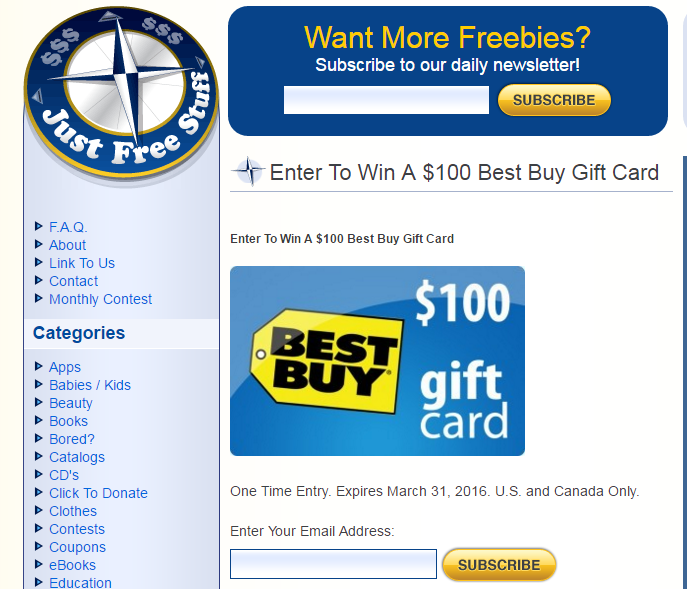 Other than freebies, Best Free Stuff Online also features free contests and giveaways. 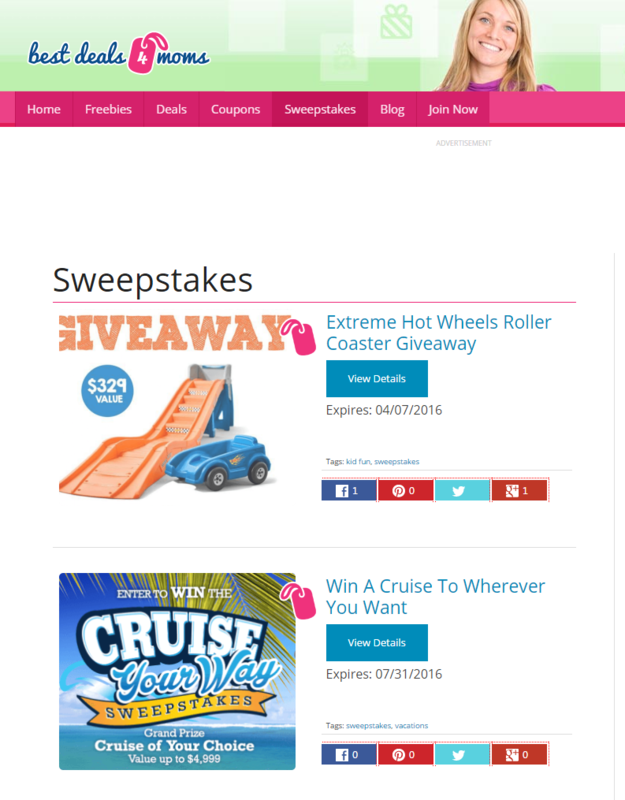 I Love Giveaways is also a popular destination for participants to find latest Sweepstakes, Giveaways, Instant Win Games, and Contests available on the web. 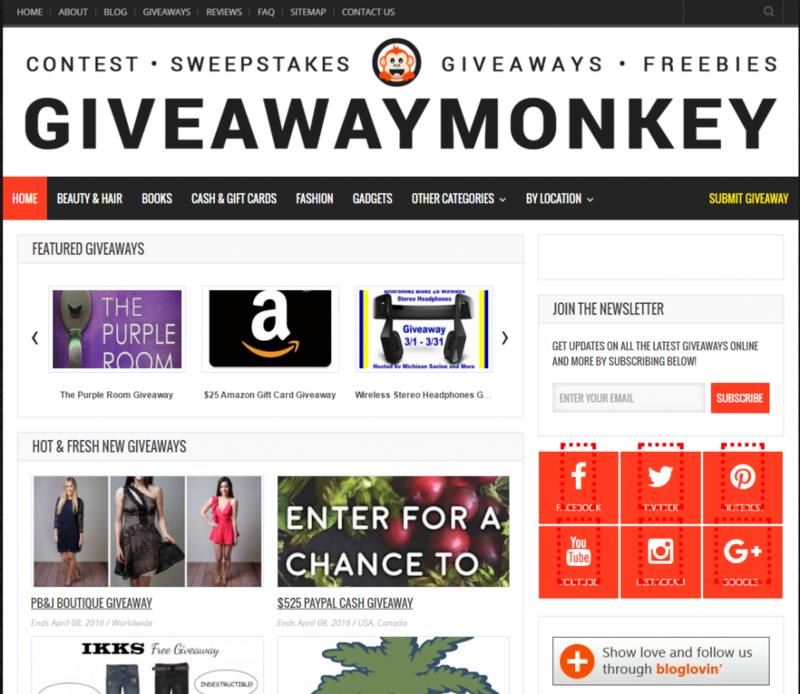 Giveaway Monkey is popular source among consumers to giveaways, freebies, contests or competitions, and sweepstakes online. 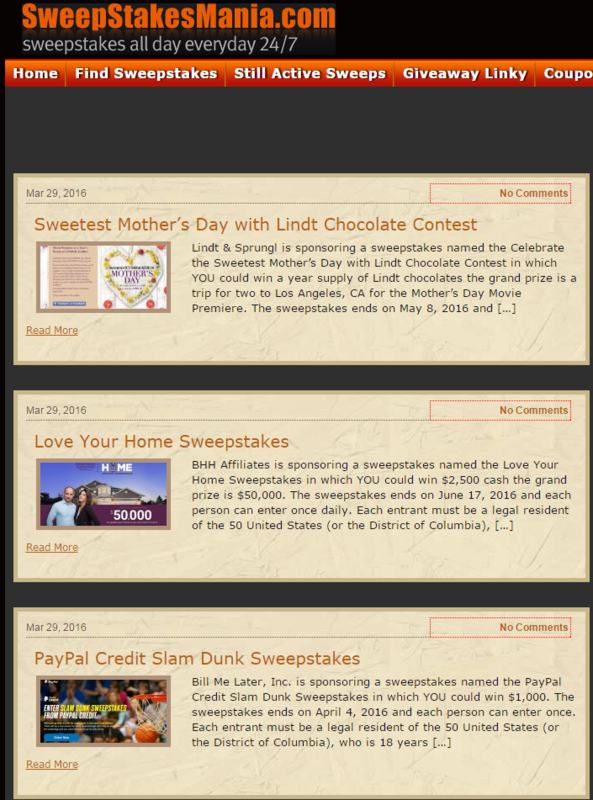 Online Sweepstakes is very popular and established website visited by thousands of people regularly to find new contest, sweepstakes and giveaways. 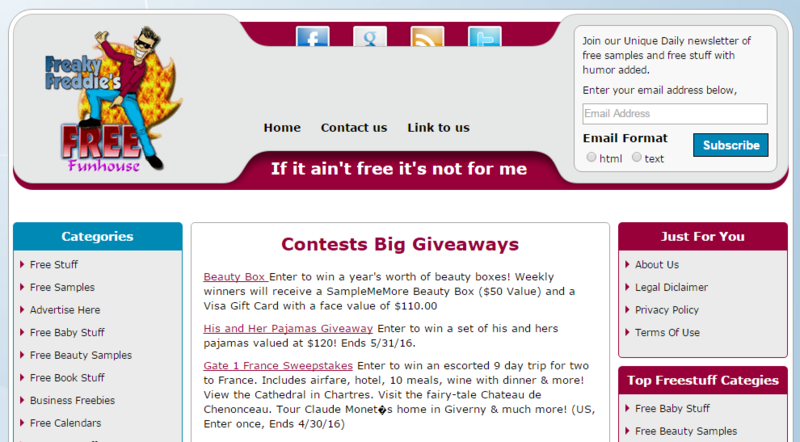 Contest Chest features online contests and giveaway from all over the world. Their members are contacted via email whenever a new contest is listed. 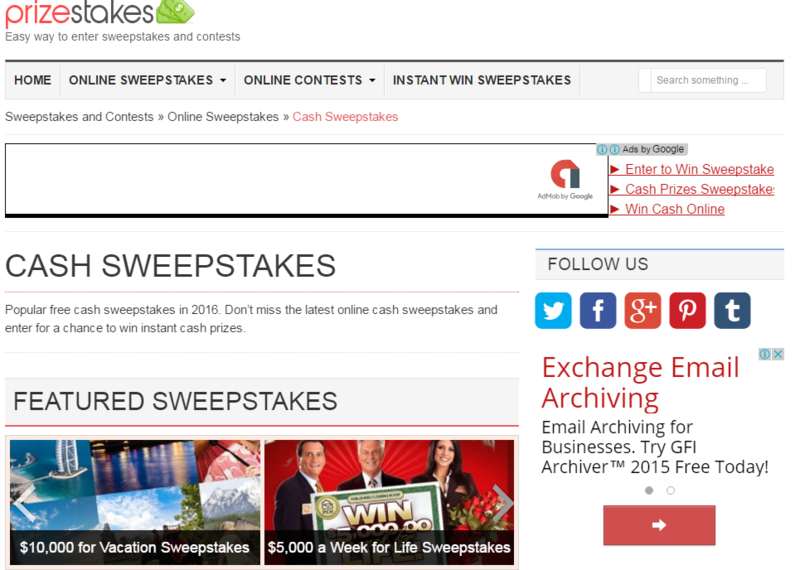 Sweepstakes Advantage was established in 1997 as one of the most comprehensive sweepstakes and contest directories on the internet. You sure can’t miss out adding your contest here. 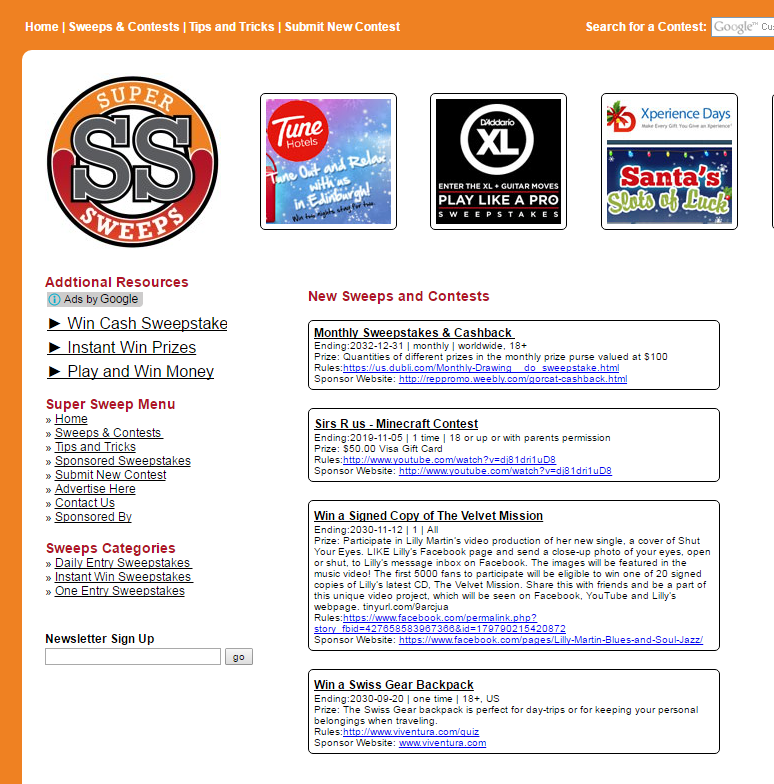 Super Sweeps is a very popular Sweepstakes and Contest Directory visited by thousands of people daily. Contest Giveaways regularly features Contests, Giveaways and Sweepstakes from around the internet. Do you have Contests, Competitions, Free Samples, Sweepstakes or Giveaways to submit ? F For Free currently supports all types of contests, sweepstakes and giveaway from US and Canada region. 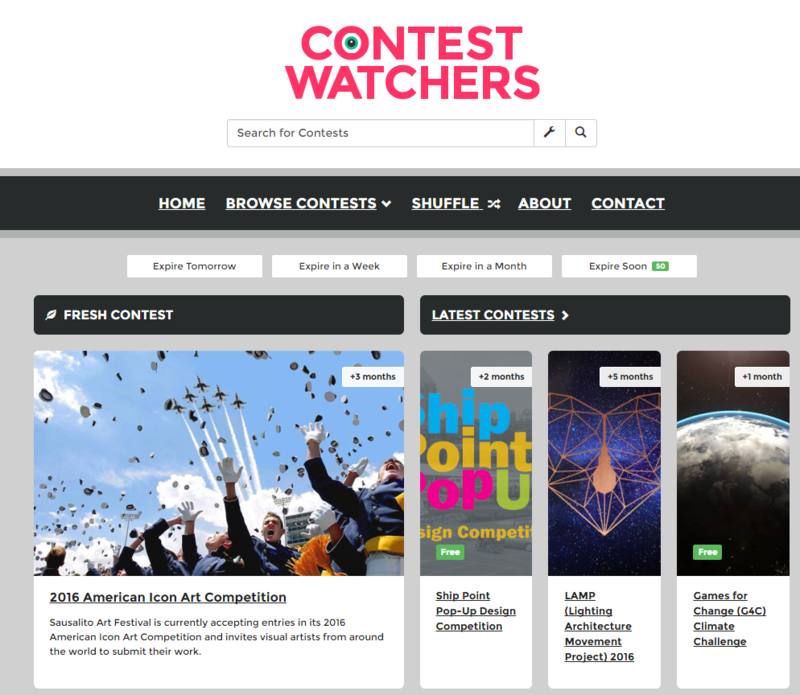 Contest Watchers is a website dedicated to creative challenges and competitions worldwide. With a huge database of international contests in various disciplines, Contest Watchers has a huge following of contest participants. Just Free Stuff is also another very old and established website that receives hundreds of thousands of visitors each month with over 100 k subscribers. 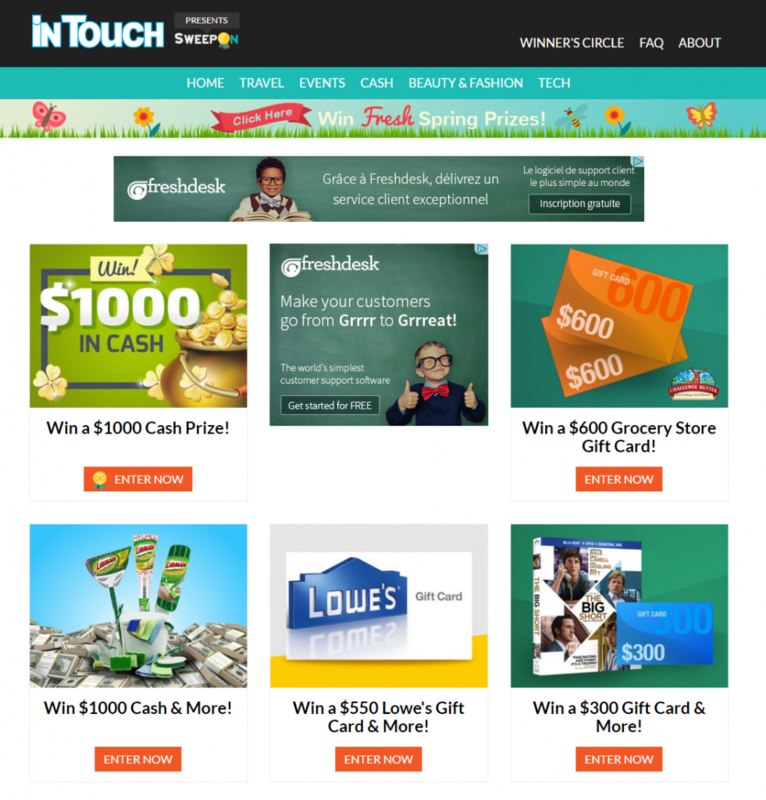 InTouch adds new sweepstakes and contests from all the internet on a weekly basis. FreebieDot.com source freebies, free stuff and giveaways on a daily basis. TheFreeSite.com offers a regular roundup of online sweepstakes, drawings and contests. 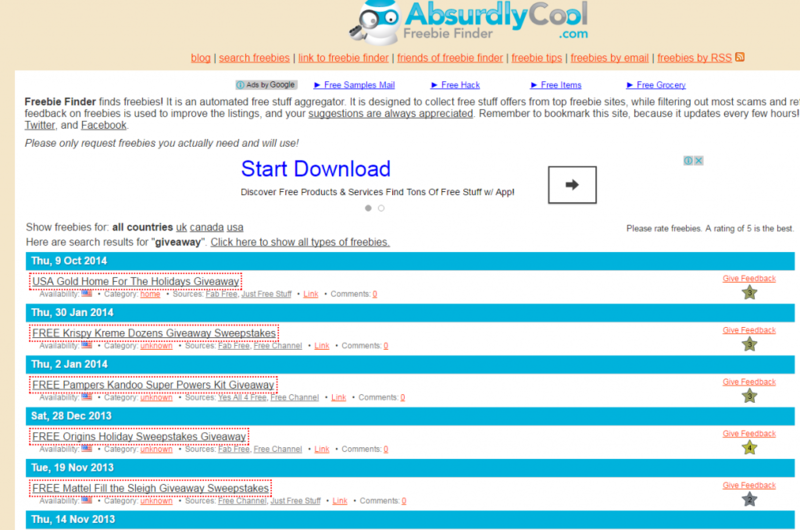 Absurdly Cool’s Freebie Finder is a an automated free stuff aggregator, which is designed to collect free stuff, contest and giveaways from over the internet. 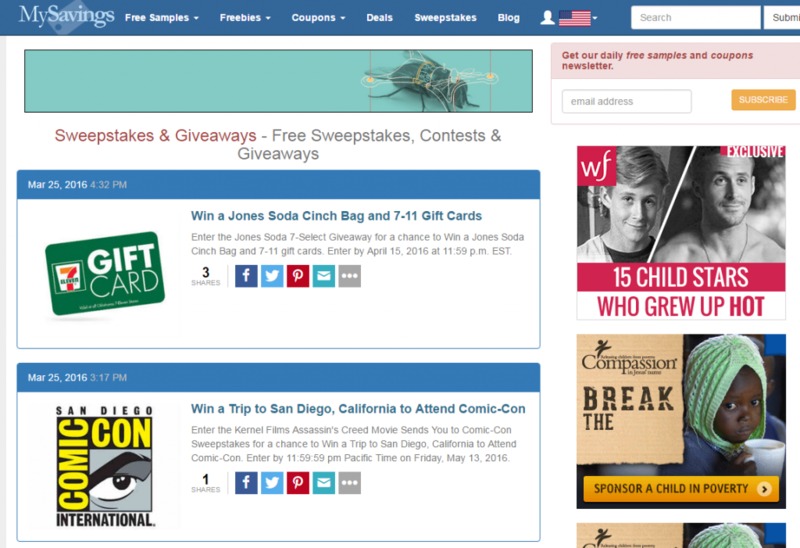 Free N Cool features top contests and giveaways on their website. 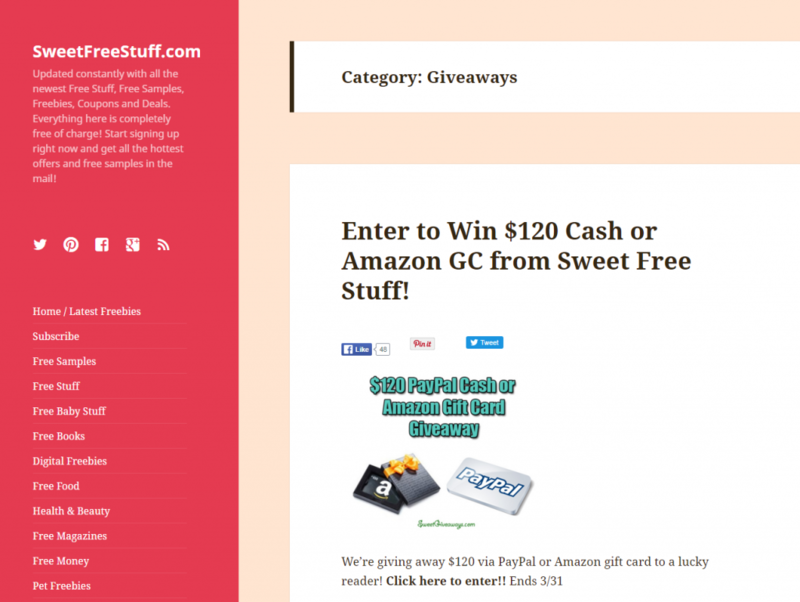 Sweet Free Stuff is updated constantly with all the newest Free Stuff, Contest and Giveaways. 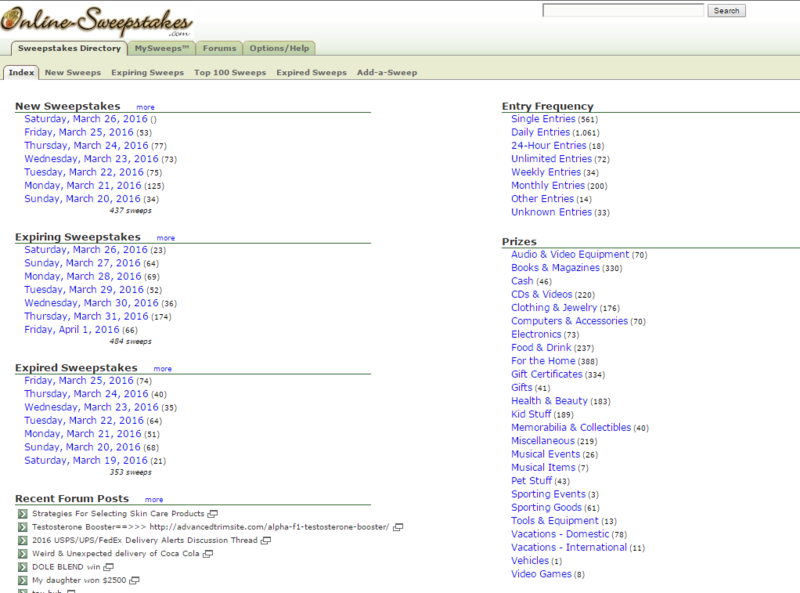 Free Mania compiles high value contests & giveaways regularly. 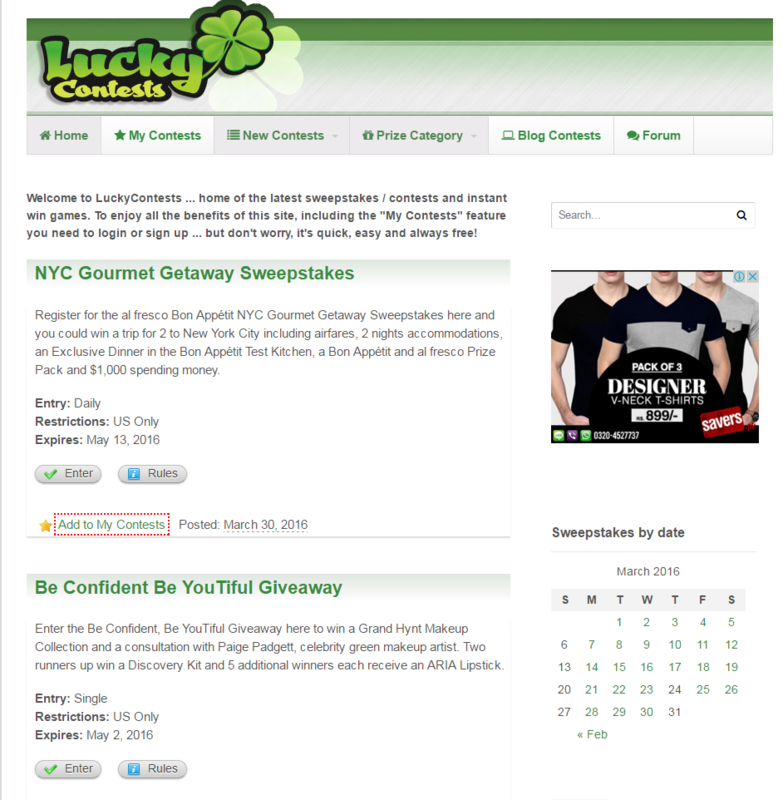 Lucky Contests is the home of the latest sweepstakes and contests. You sure can’t miss adding your contest here. Online Video Contests is the #1 Video Contest aggregation site on the Internet! If your contest has something to do with videos, this is probably the best site to promote your contest. 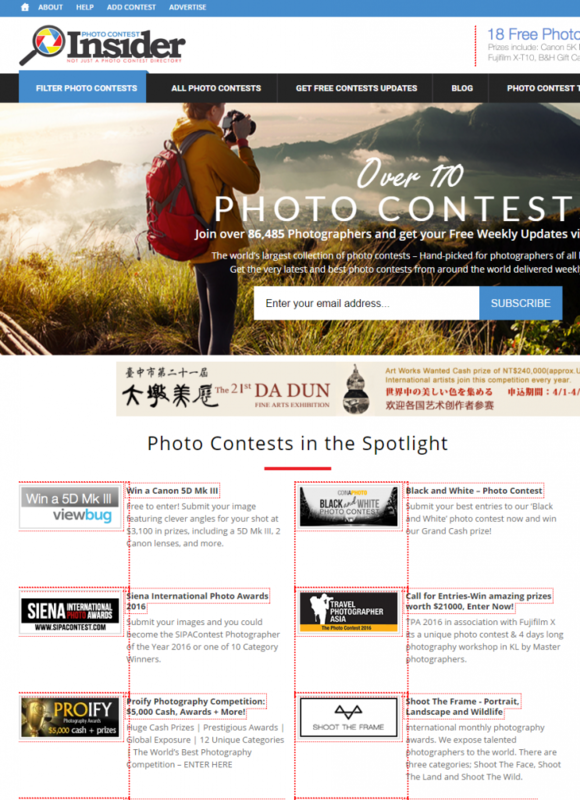 Photo Contest Insider keep an up to date and comprehensive list of photo contests. 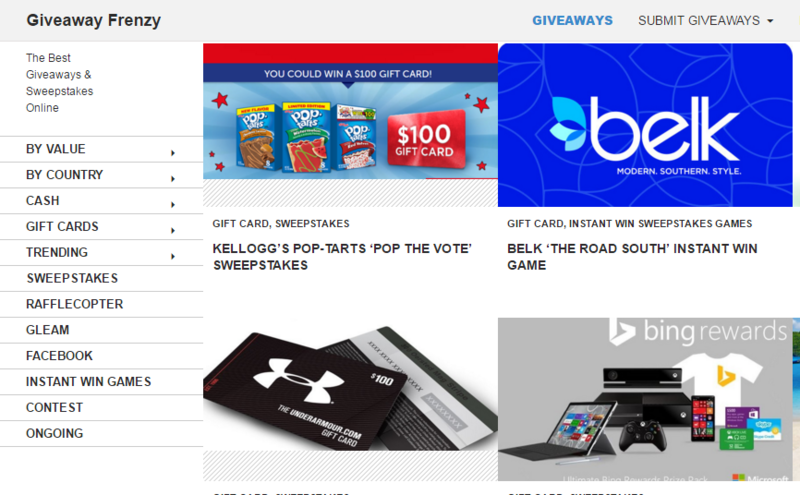 Ninja Win features new contests and giveaways from around the web. Its quick and easy to add your contest. 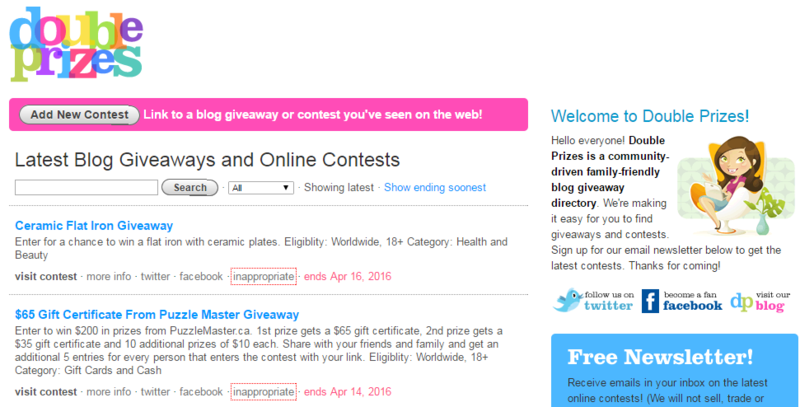 About.com aggregates new contests and giveaways from over the internet. Contact About.com contests specialist to have your contest listed there. Vobus constantly adds new contests and giveaways to cater its growing contest enthusiasts. 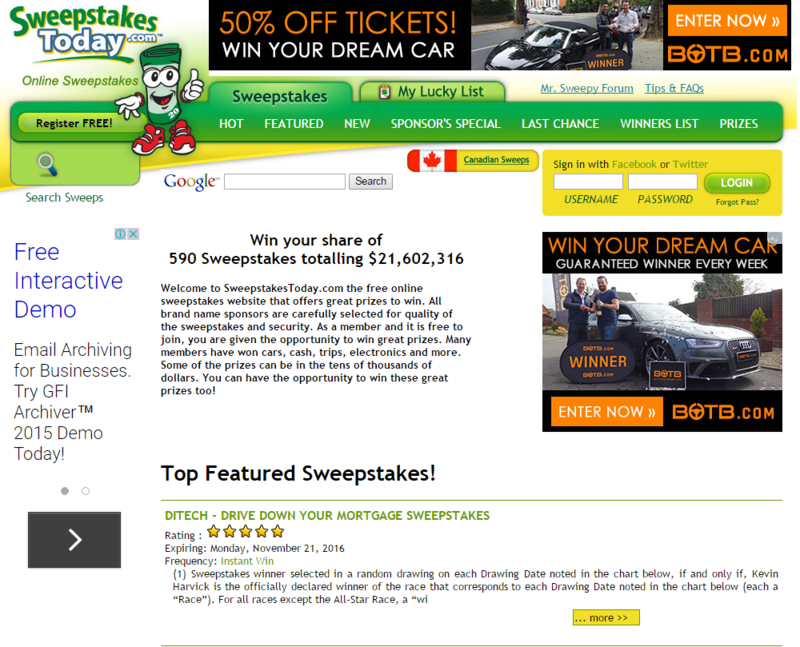 Sweepstakes Today is a popular online sweepstakes website with thousands on monthly visitors. 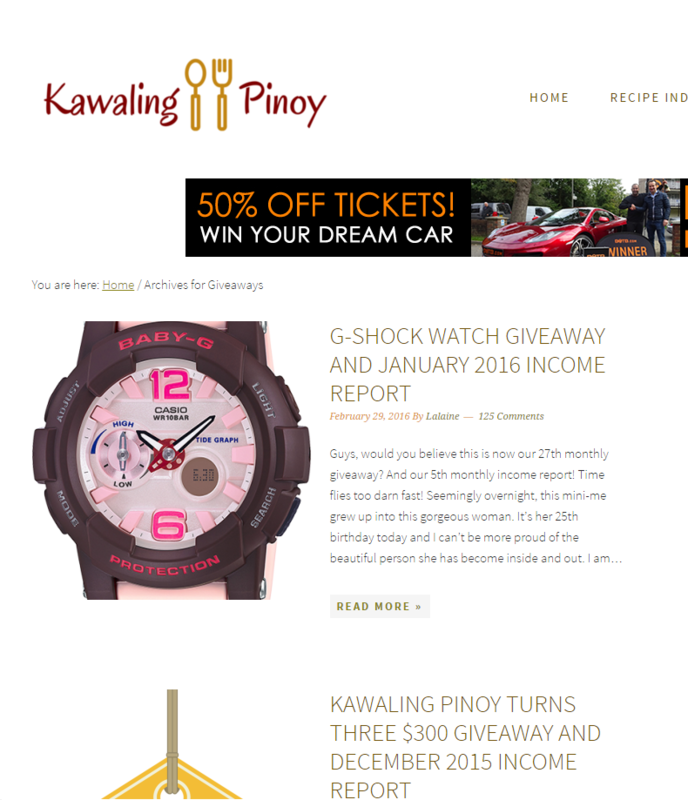 If your contest or giveaway has something to do with food, dining or recipes, Kawling Pinoy is the perfect website for it. 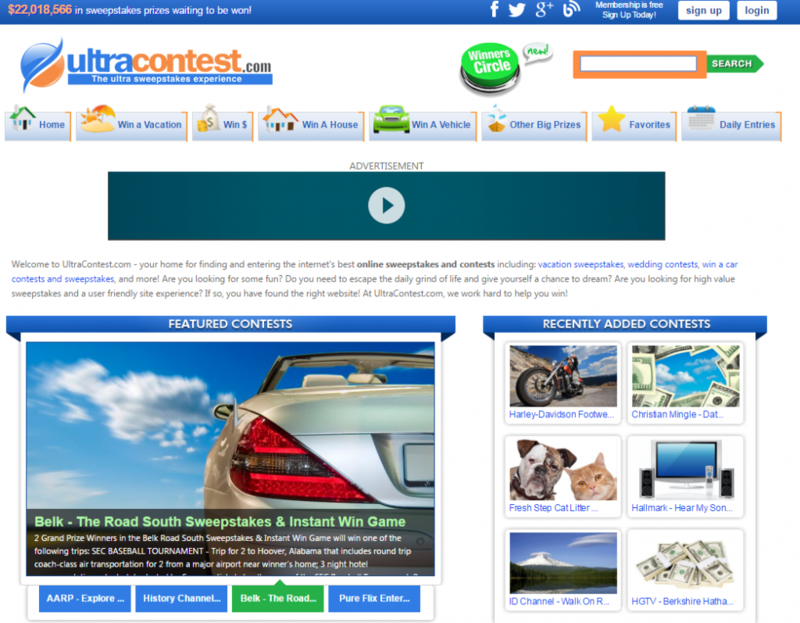 Ultra Contest strives to feature the best online sweepstakes and contests. 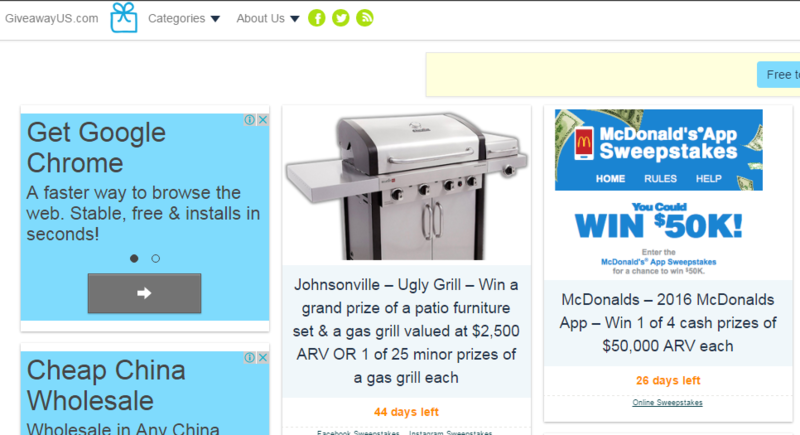 Win Prizes Online is a sweepstakes, contests, giveaways and deals aggregator with an interactive community. 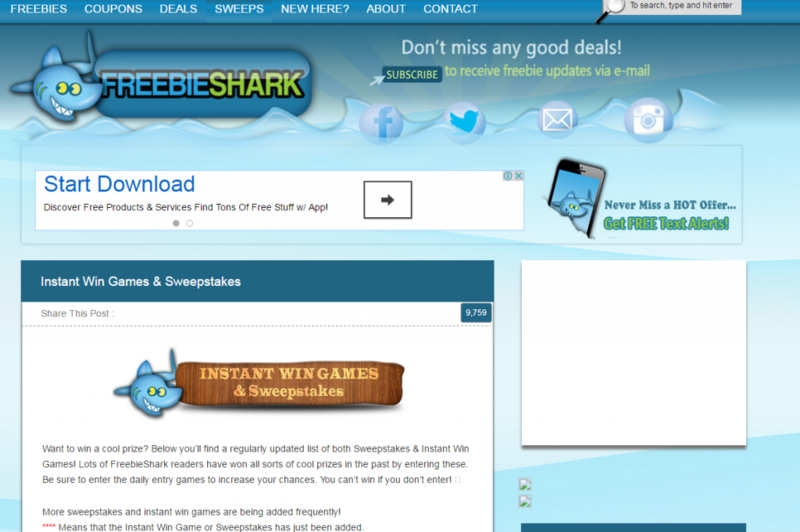 Freebie Shark features a regularly updated list of both Sweepstakes & Instant Win Games. 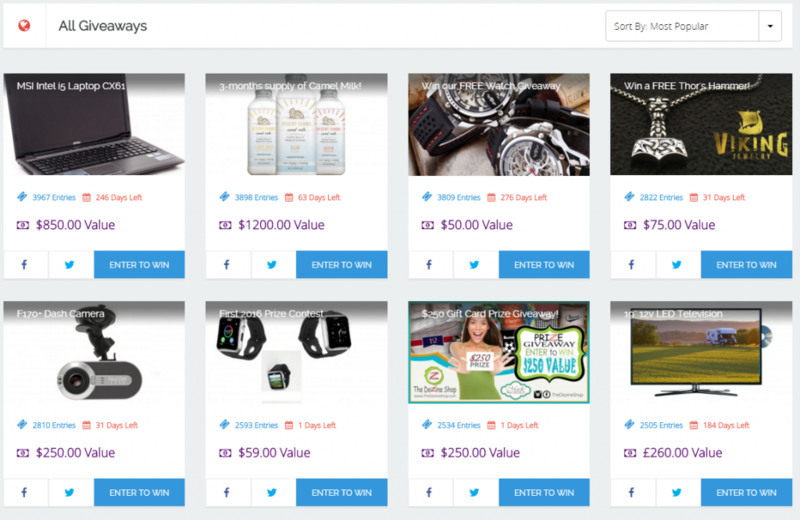 Slickdeals is the leading and most trusted online community dedicated to sharing online contests and giveaways. 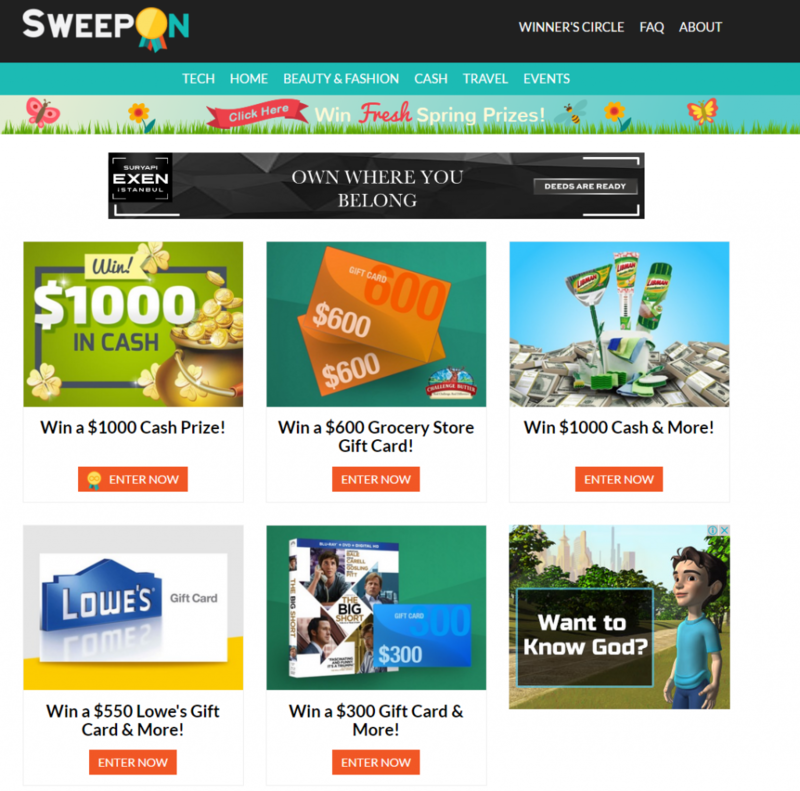 Sweepon features cool new contest, giveaways and sweepstakes for their growing community. 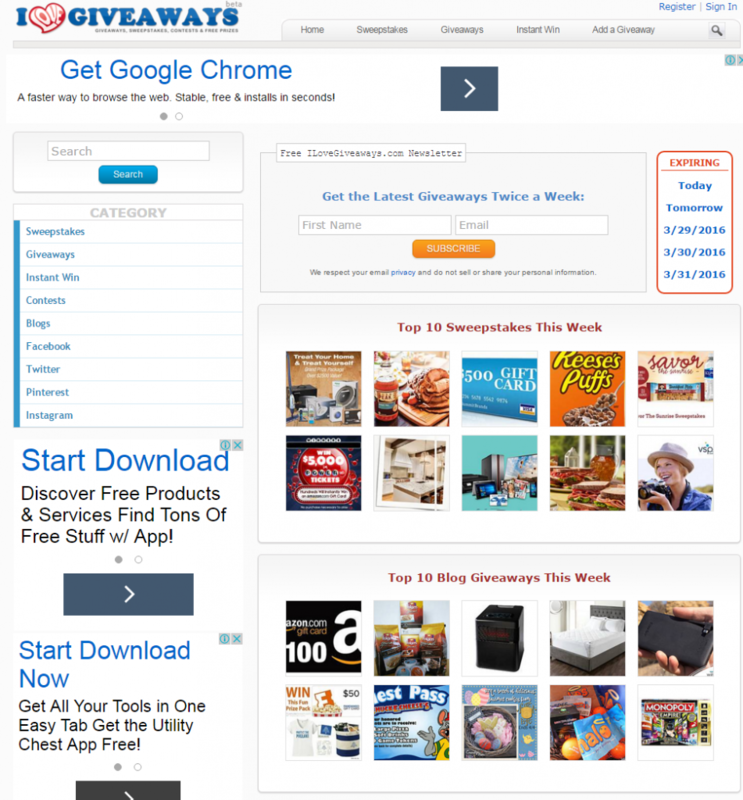 Bigsweeps features sweepstakes from the best around the around the web. 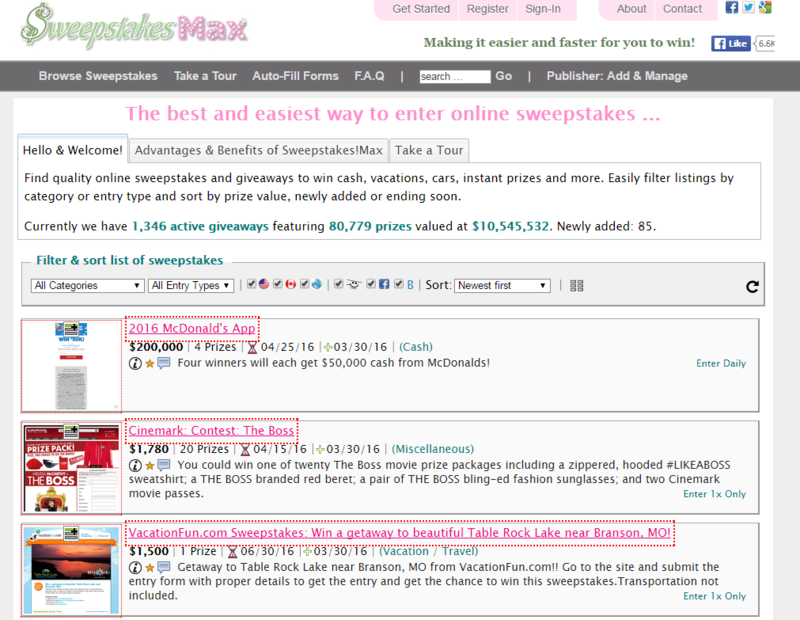 Sweepstakes Max features bunch of online sweepstakes, contests and giveaways for their community. 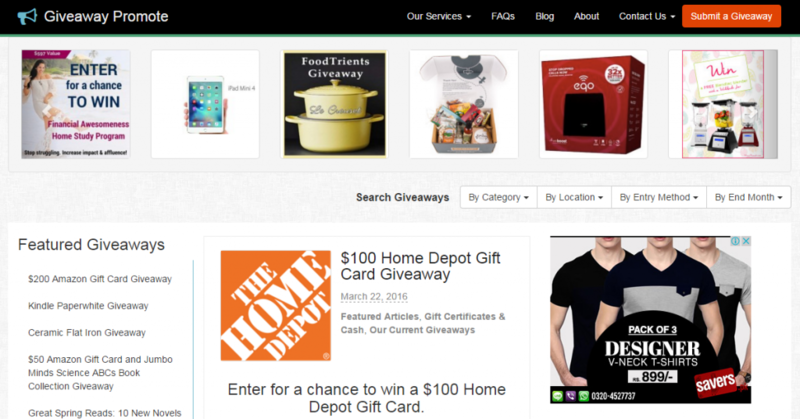 Shop Your Way features contests and giveaways ideally targeted for shoppers. 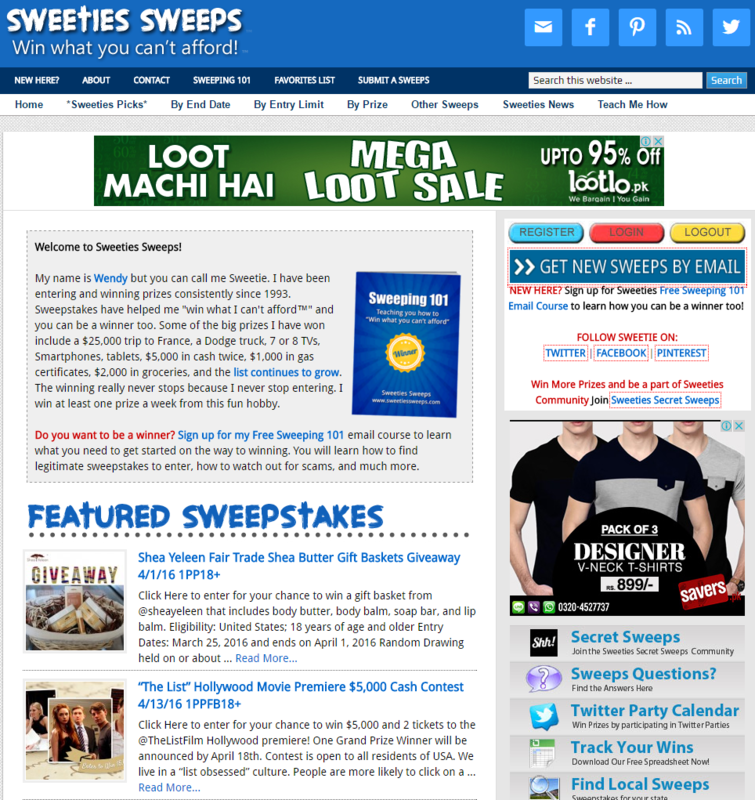 Giveaways and Swepstakes.com lists some of the very best sweepstakes, giveaways, and contests from around the web. 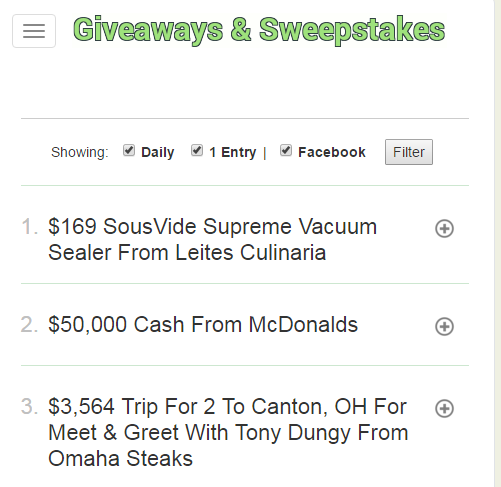 Sweetie Sweeps lists down new sweepstakes and giveaways on their website. 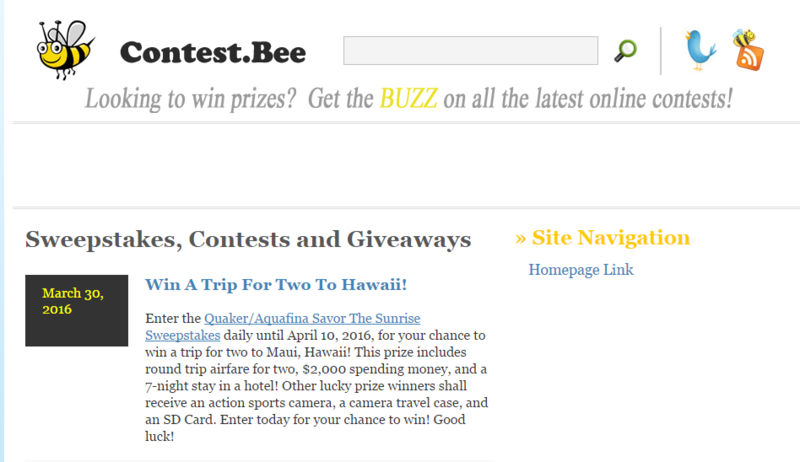 Contest Bee is a collection of the best online contests, sweepstakes and giveaways. 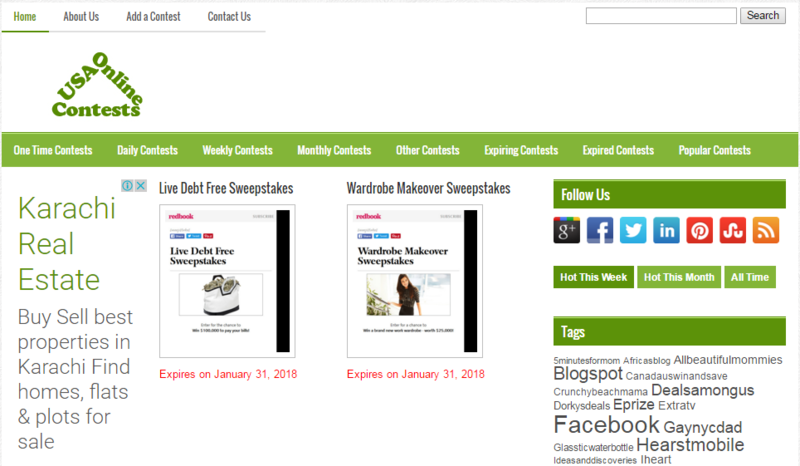 Woman Freebies specifically features sweepstakes, coupons and giveaways for their female audience. 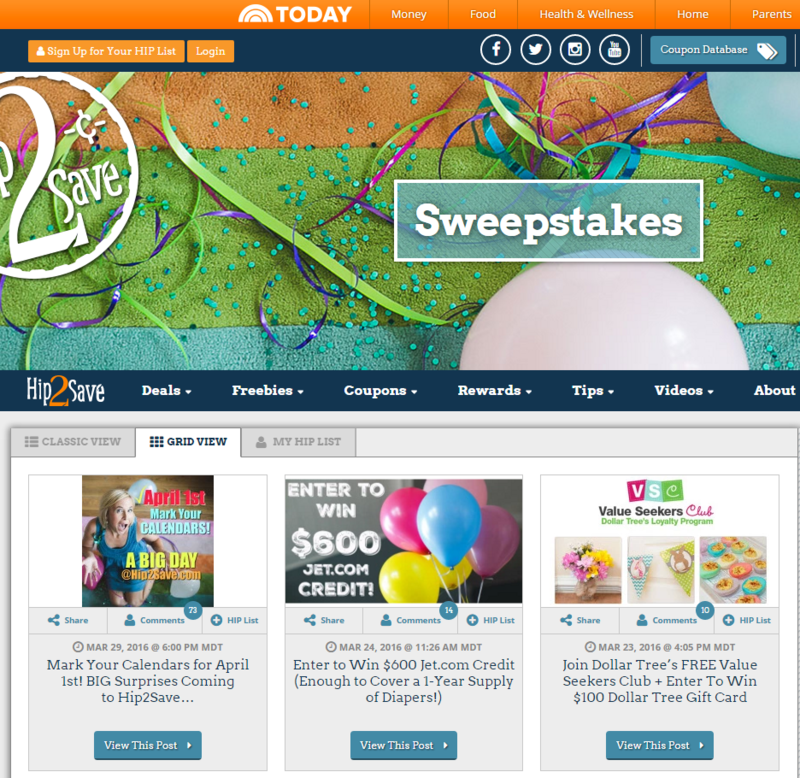 Hip2Save is a very recognized coupon and giveaway website that regularly featyures new entries. 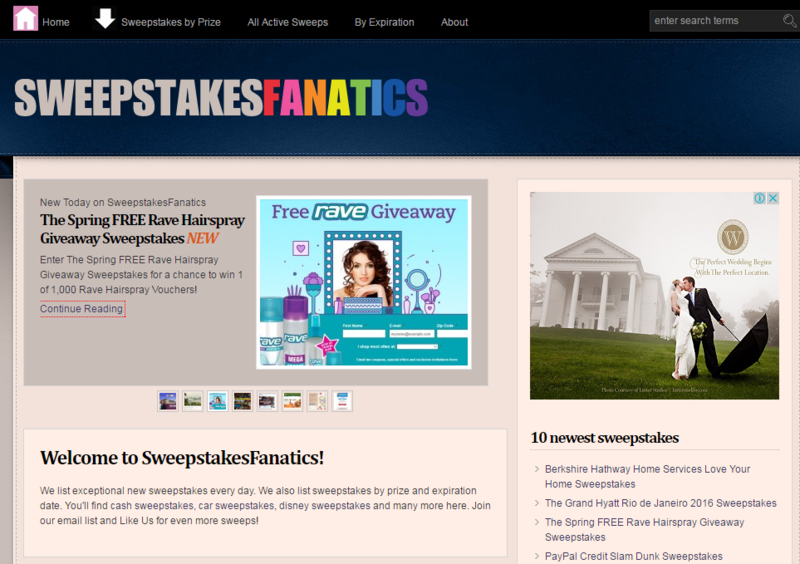 Sweepstakes Fanatics lists new sweepstakes, giveaways and contests every day. 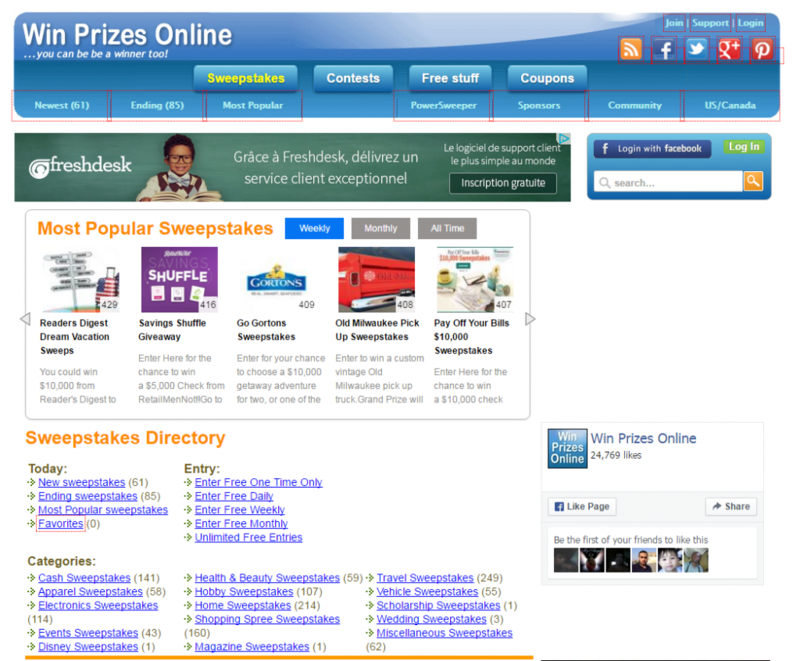 Sweepstakes Mania is the leading directory of online sweepstakes, contests, and giveaways. 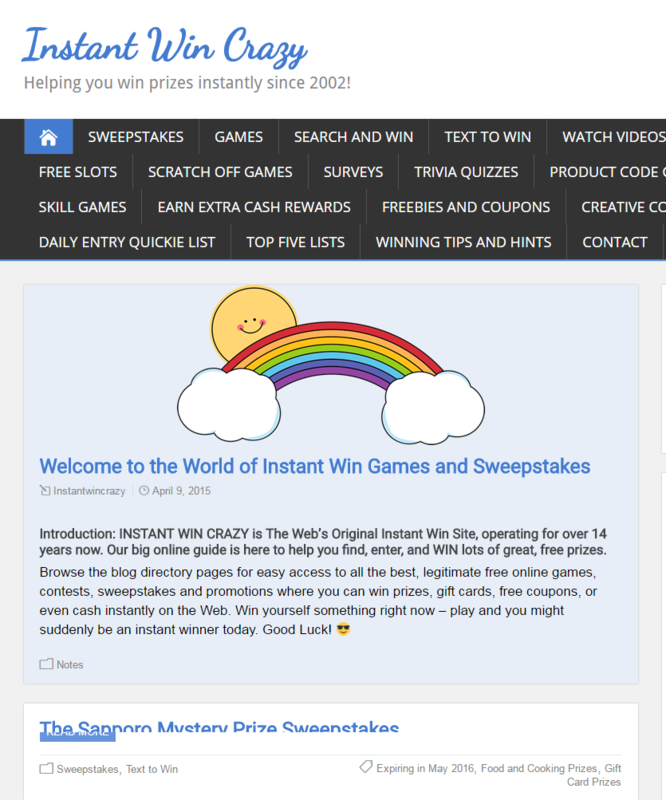 Instant Win Crazy is a directory of links to giveaways and contests across the internet. 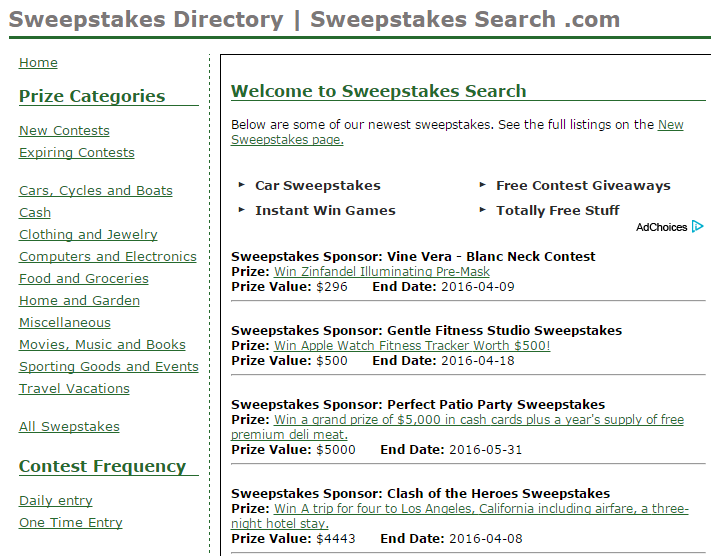 Sweepstakes Search is an online sweepstakes directory lists sweepstakes and contests. 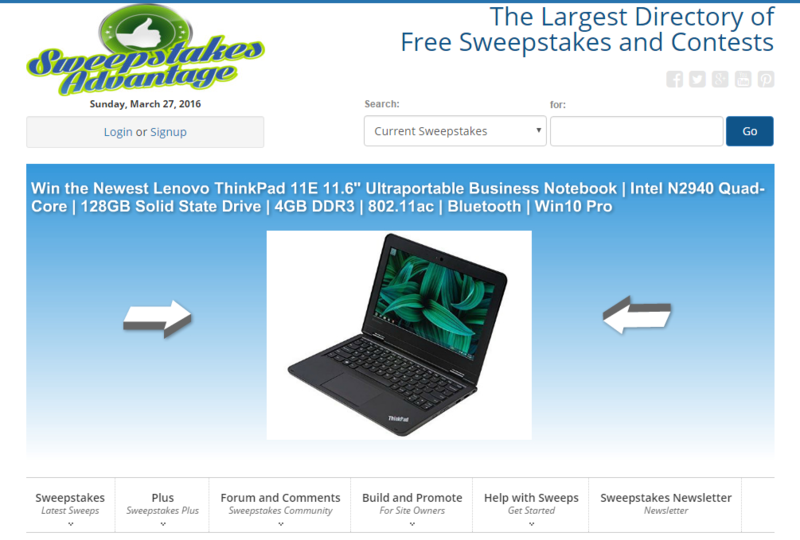 Win a Sweepstakes provides a free directory for listing new contests, giveaways and sweepstakes from around the internet. 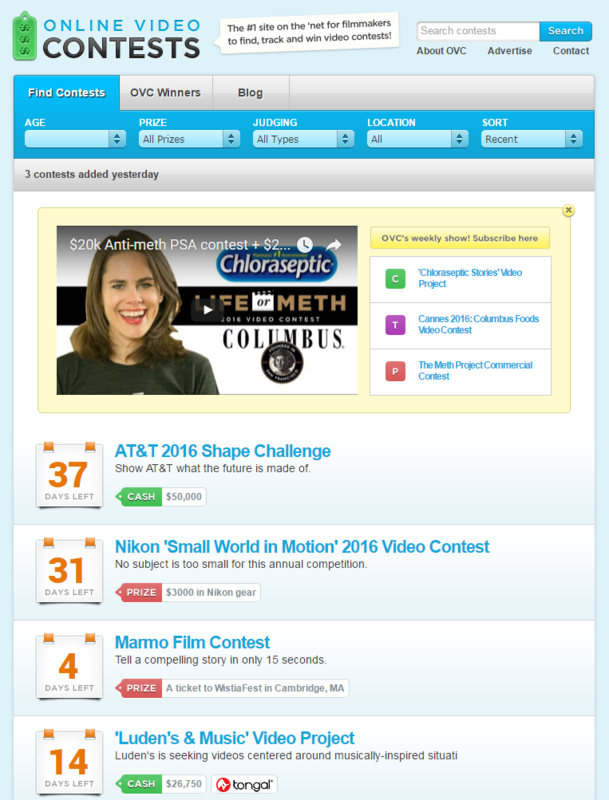 Enter and Win features new contests and giveaways for their aspirant community. 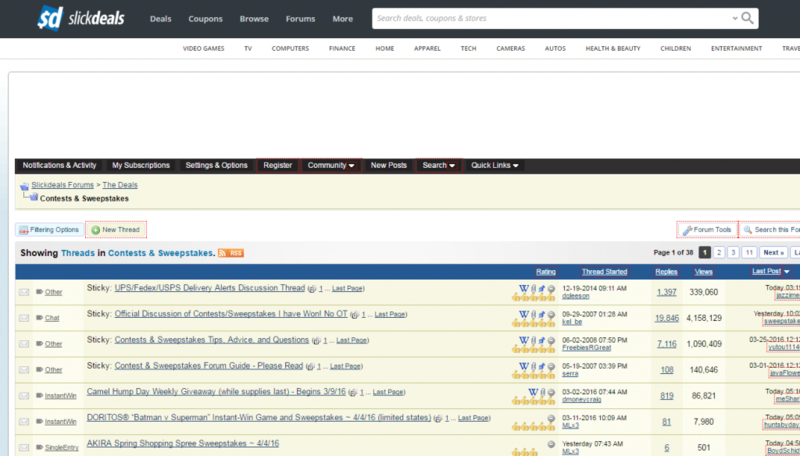 The Free Sample Site add new contests, giveaways and sweepstakes in its popular forum. 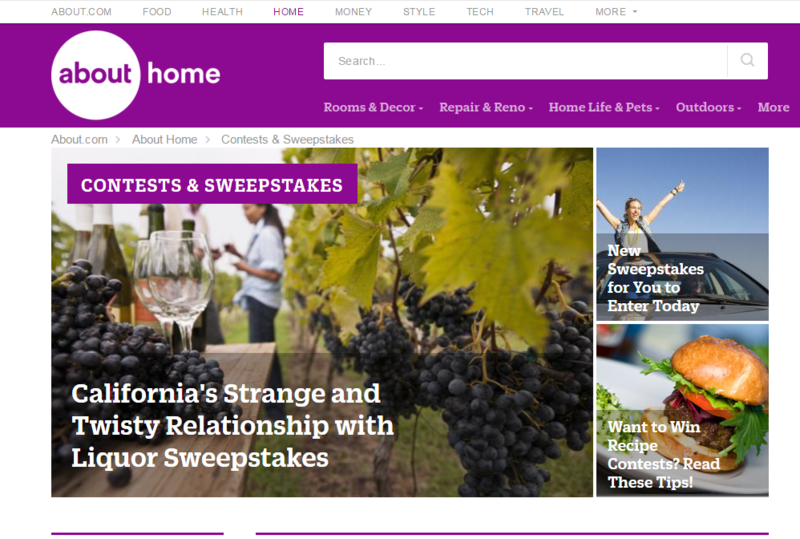 Entertainment Tonight is a very popular media site that features giveaways and contests from third parties. Fish Bowl Prizes regularly adds new contests and giveaways in nearly all type of niches and businesses. 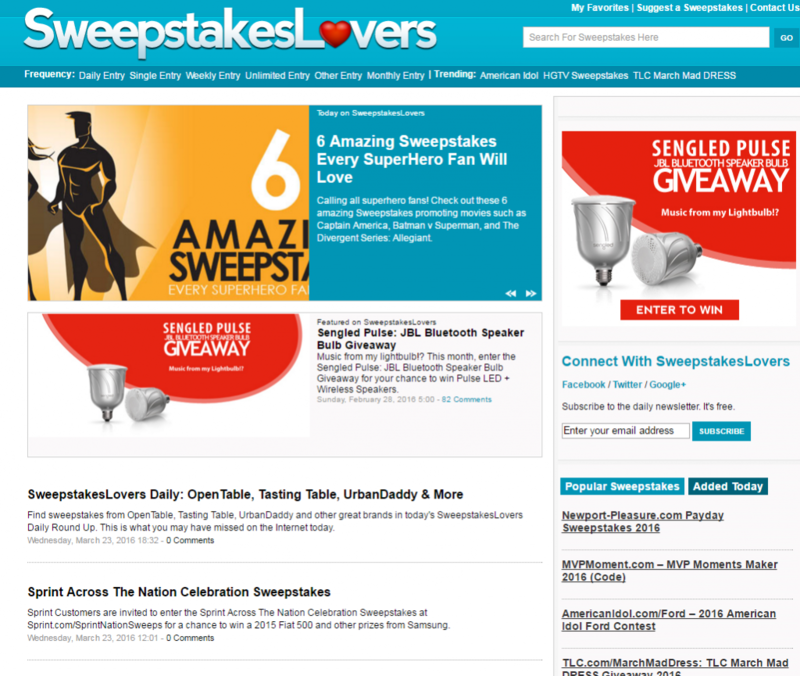 Sweepstakes Lovers is a sweepstakes resource where you’ll find all the sweepstakes available online. It is updated with new sweepstakes on a daily basis. 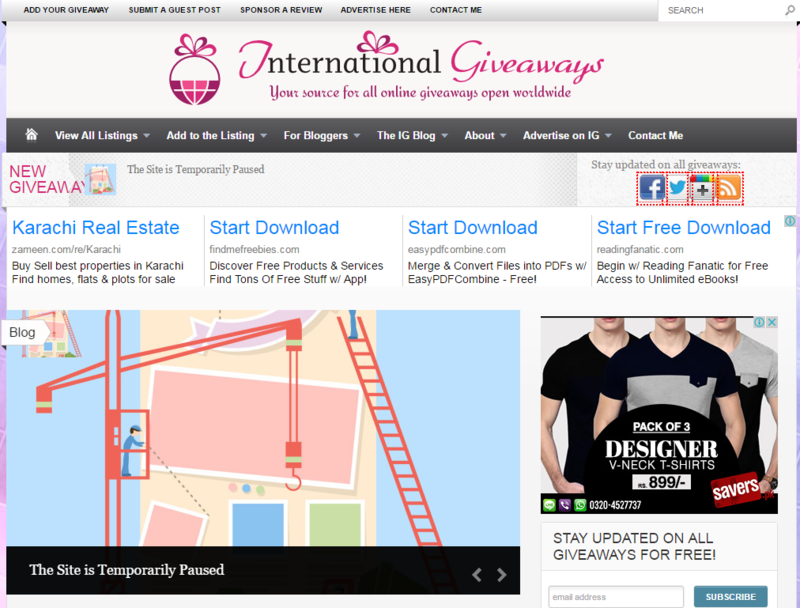 International Giveaways is the best source to find free giveaways from all over the globe. 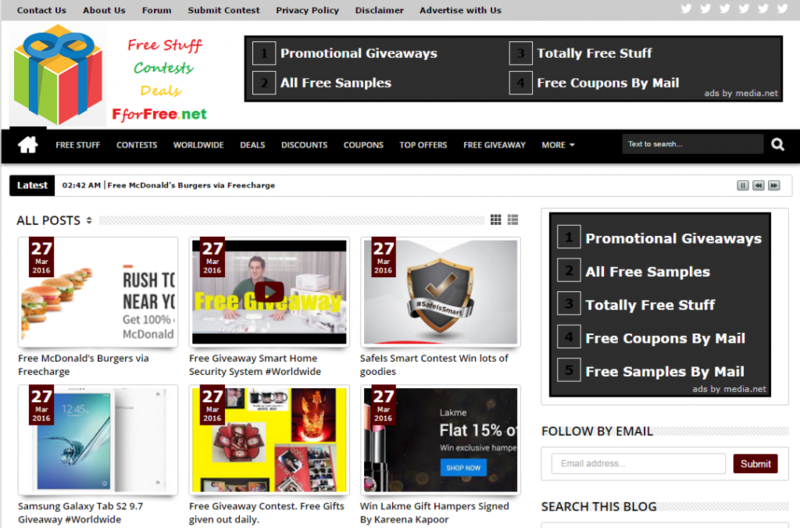 Giveaway Promote is the leading giveaway promotion website visited by thousands of people monthly. Double Prizes submits and promote your giveaways, sweepstakes and contests to their sizable audience of giveaway entrants. 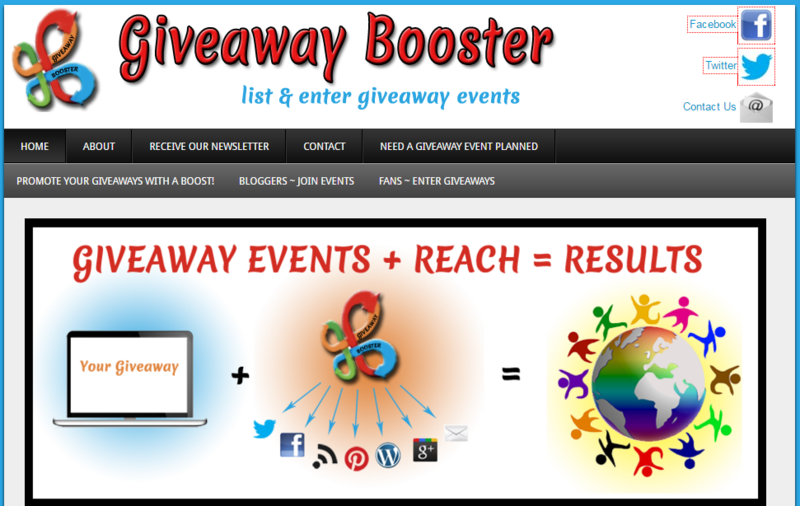 Giveaway Booster is a promotional social media platform tool for you to promote your giveaways, sweepstakes, and contest. 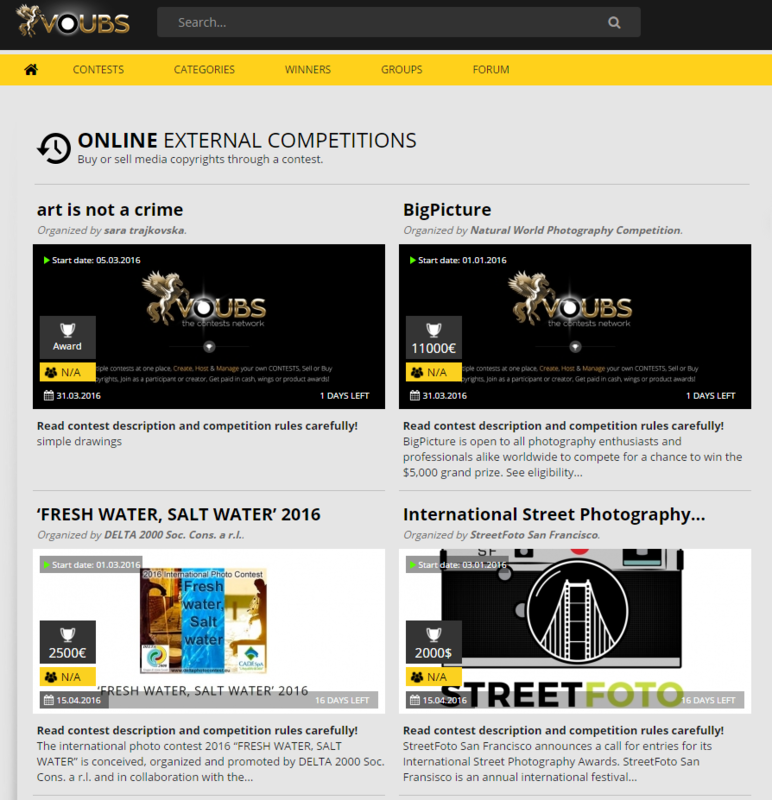 Contest Beat aims to bring in the best contests for their audience. 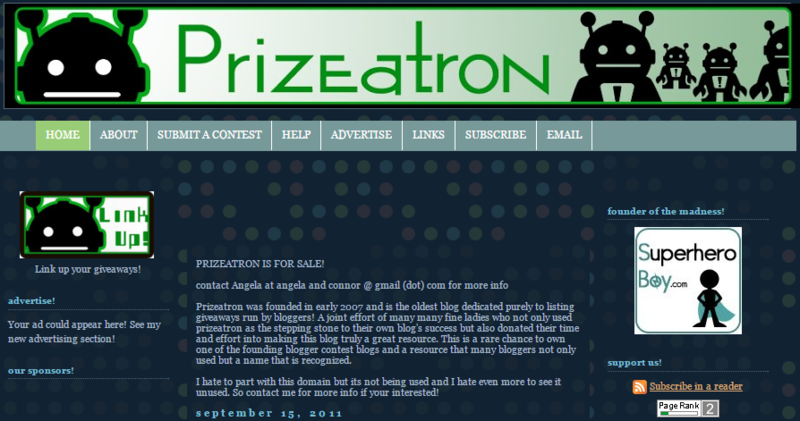 Prizeatron was founded in early 2007 and is the oldest blog dedicated purely to listing giveaways run by bloggers! 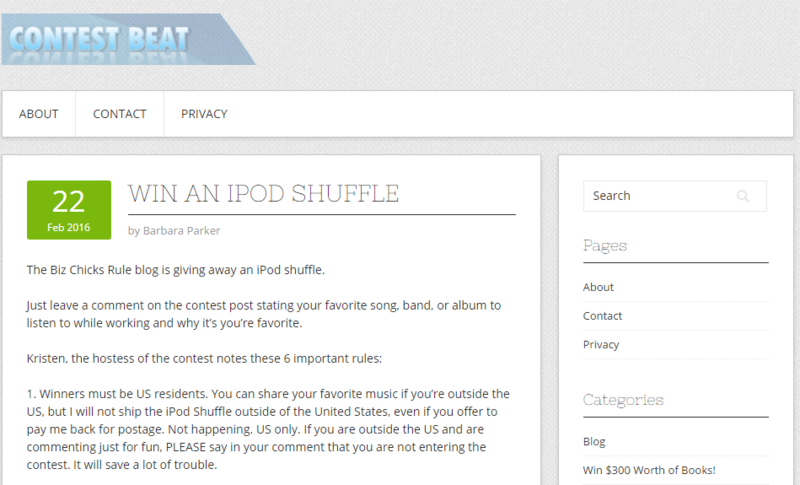 Contest Corner began as a simple collection of giveaway listings. JustSweep is a simple place to enter and promote your own giveaways! 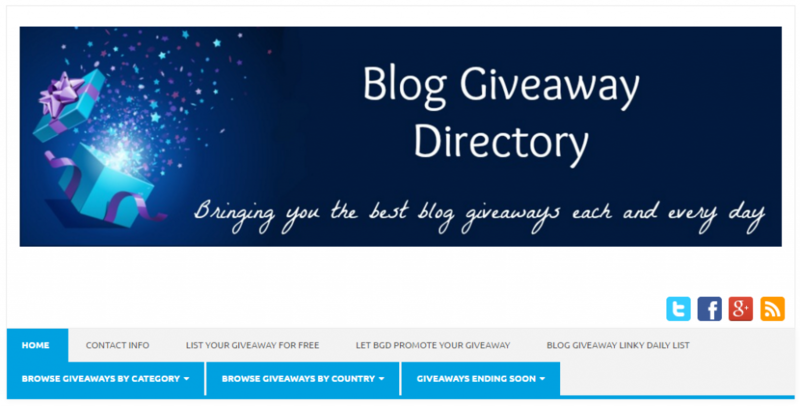 Giveaway Junkie actively collect giveaways hosted by bloggers from all over the internet. Camera Giveaways.com was created specifically to feature camera related contests and giveaways. 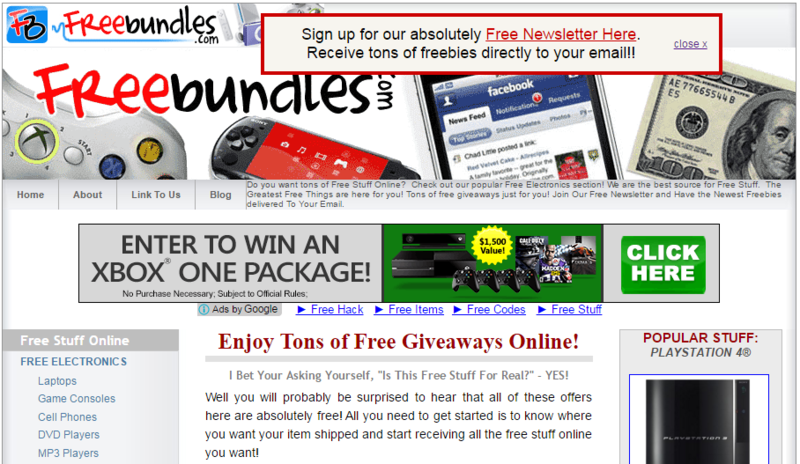 Free Bundles adds free giveaways and contests on their website. 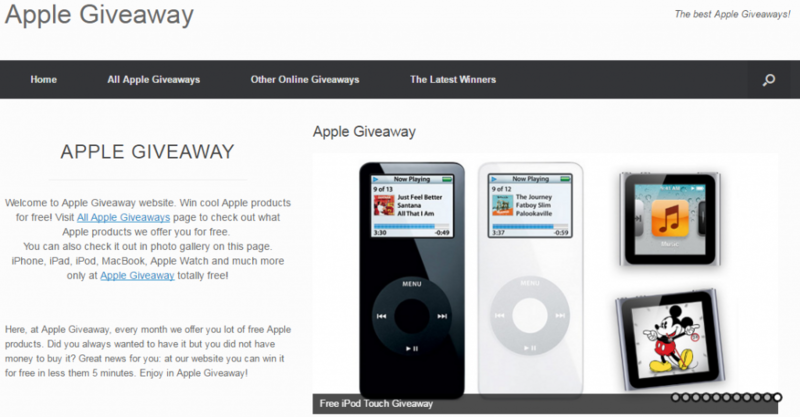 Apple Giveaway only features contests and giveaways related to Apple products. 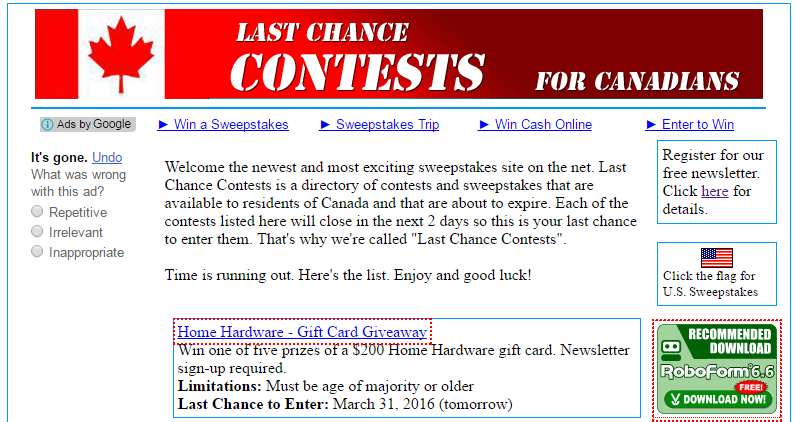 Last Chance Contests is a directory of contests and sweepstakes that are available to residents of Canada and that are about to expire. Each of the contests listed here will close in the next 2 days so this is your last chance to enter them. That’s why they are called “Last Chance Contests”. 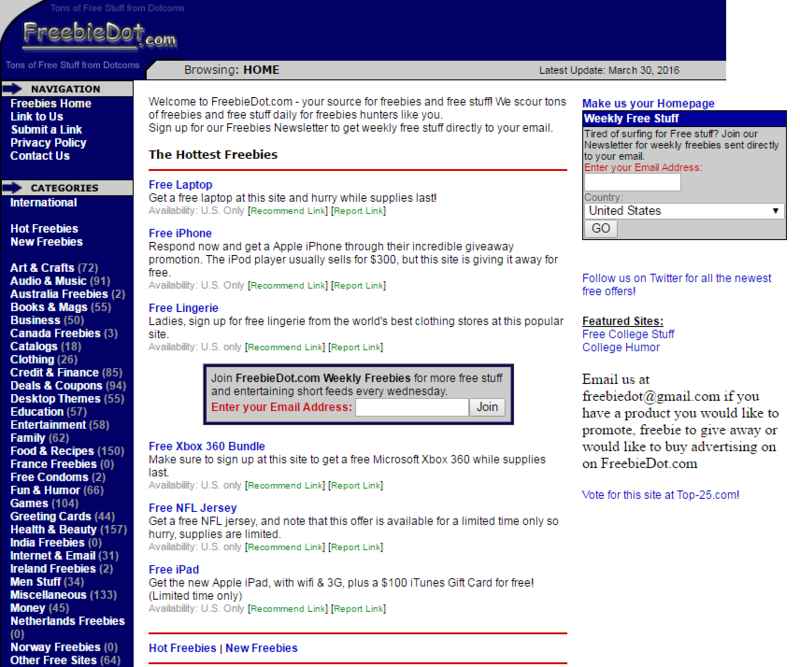 PrizeStakes features new sweepstakes and giveaways on their site. My Sweepstakes is a popular giveaways, contests and sweepstakes for the Australian people. 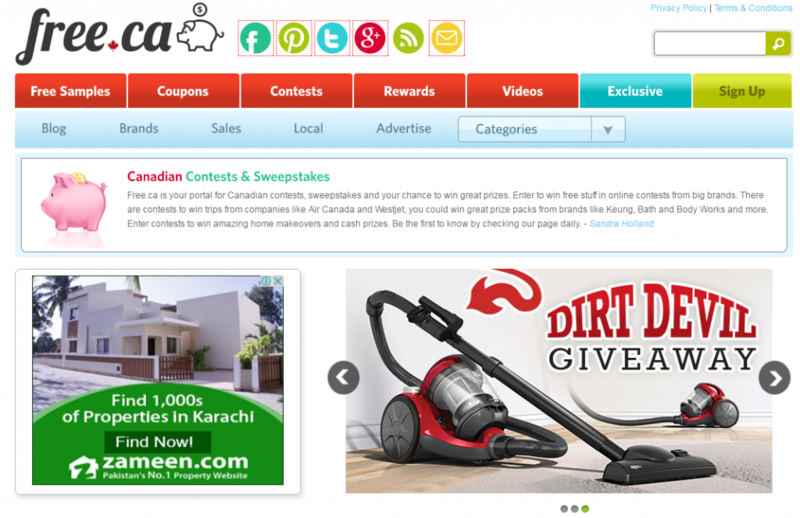 Free.ca is a portal for Canadian contests, sweepstakes and giveaways. TotallyFreeStuff.com is committed bringing you the best freebies, coupons, and deals. 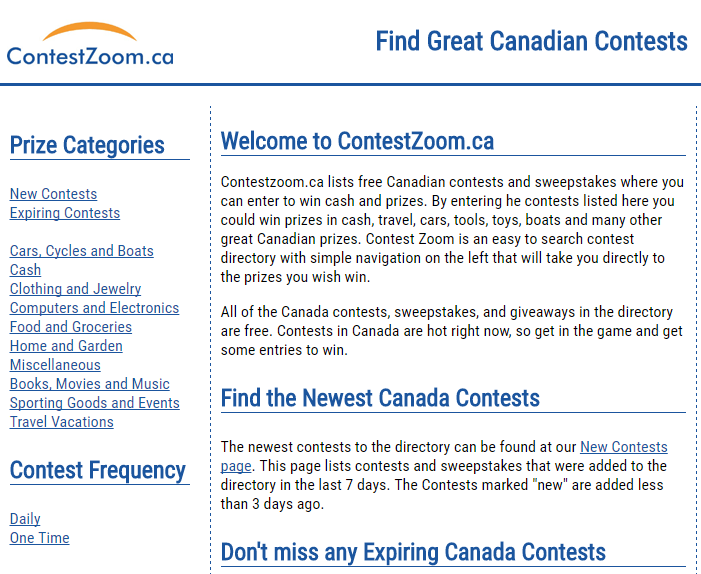 Contest Zoom features contests, sweepstakes, and giveaways happening in Canada. 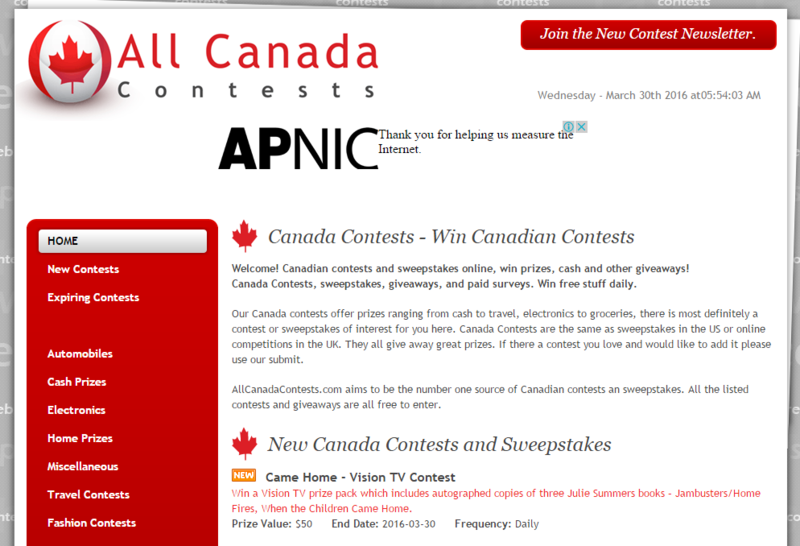 All Canada Contests lists Canadian contests and sweepstakes online and other giveaways! 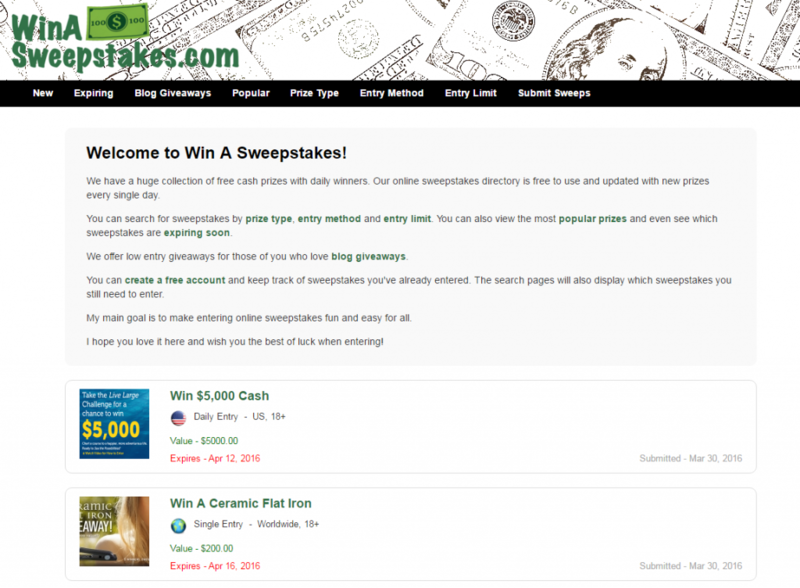 Online Giveaways daily adds online Sweepstakes, Contests and other Freebies. 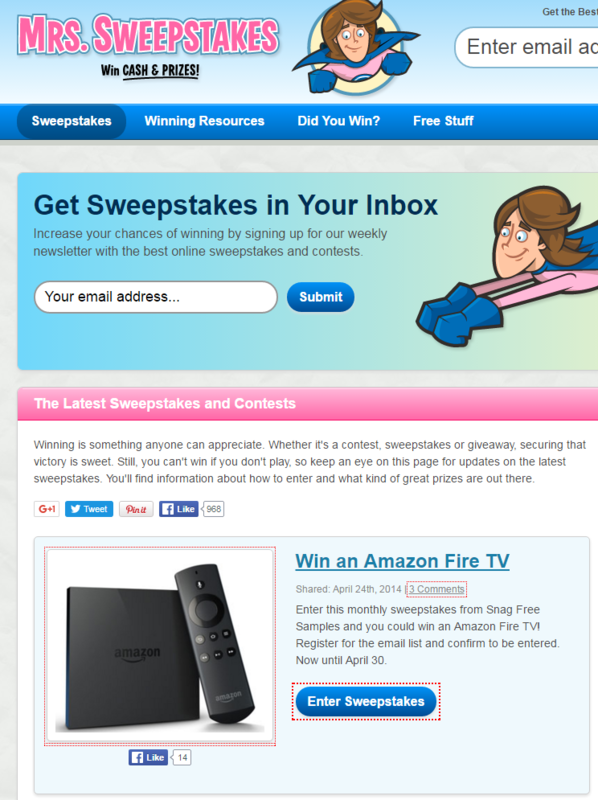 Sweepstakes Gal provides with listings of all the best sweepstakes and giveaways from around the internet. 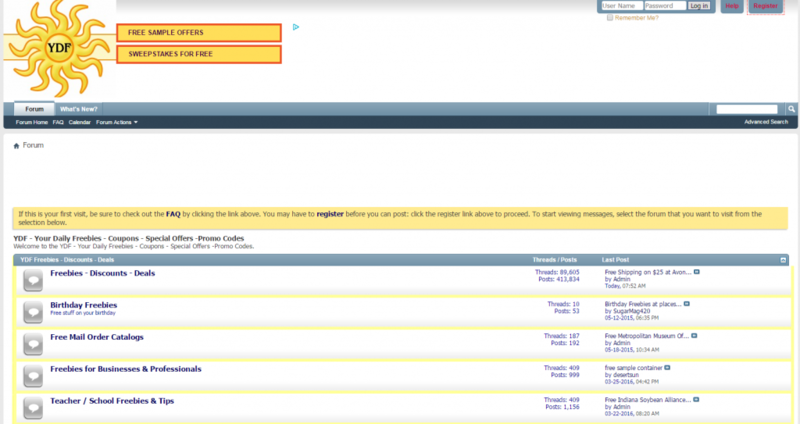 USA Contests Online.com is a United States sweepstakes and contest directory listing free to enter American contests. 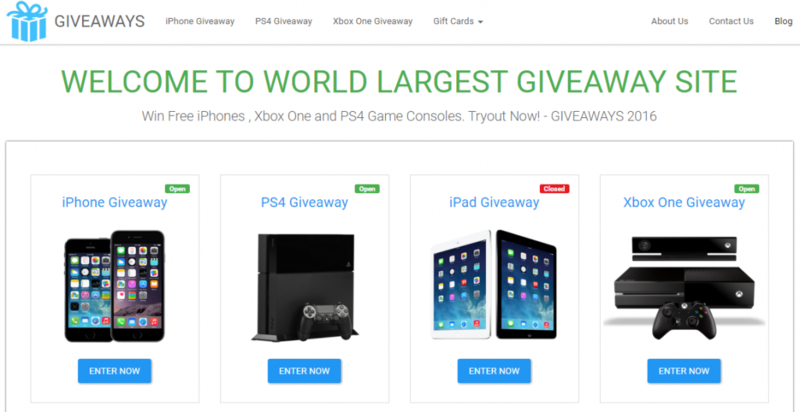 Giveaways.xyz features giveaways and contests daily on their website. 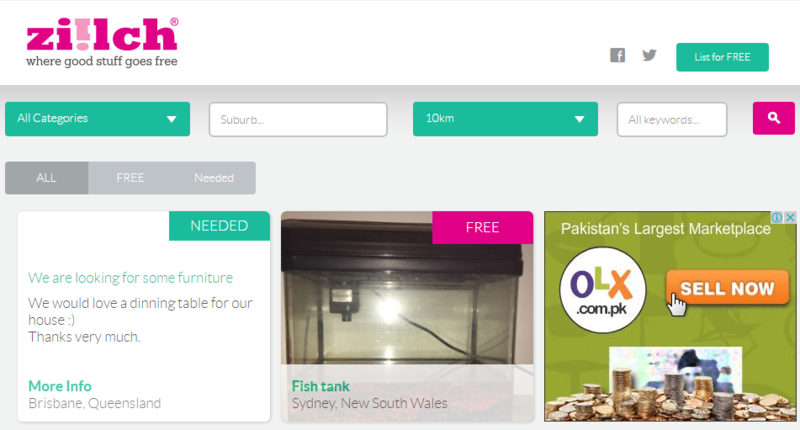 Ziilch is a free community driven website that provides Australians a way to participate in online contests and giveaways. 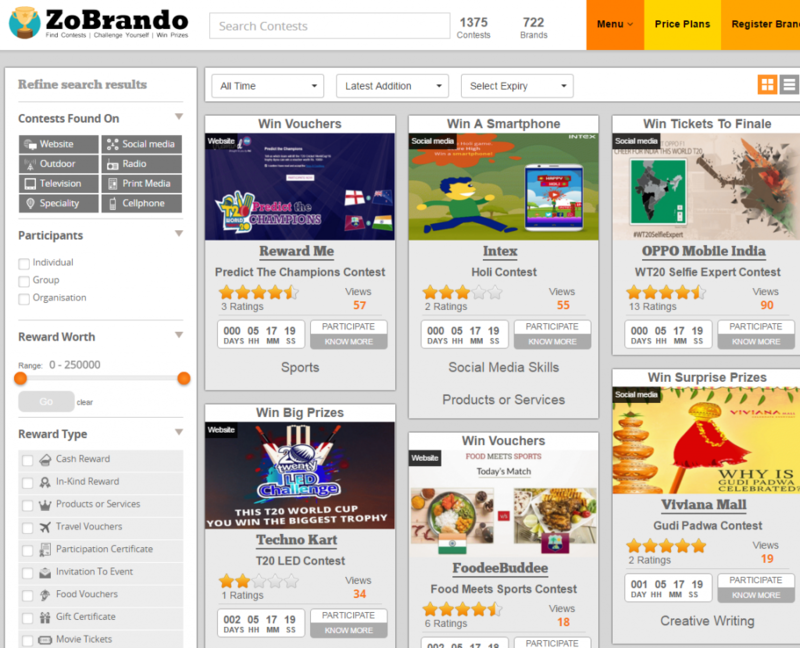 ZoBrando features all the contests and giveaways happening in India. 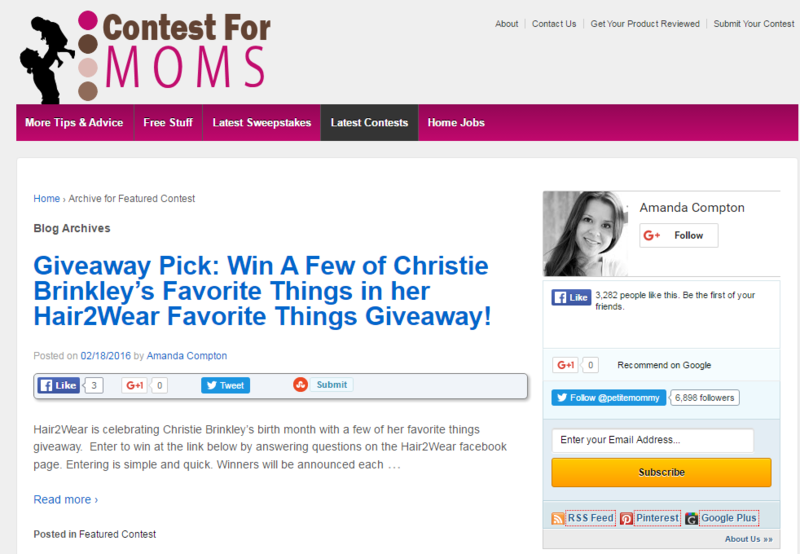 If your giveaway or contests or giveaways has something to do with moms, you sure can’t miss out adding your contest here. 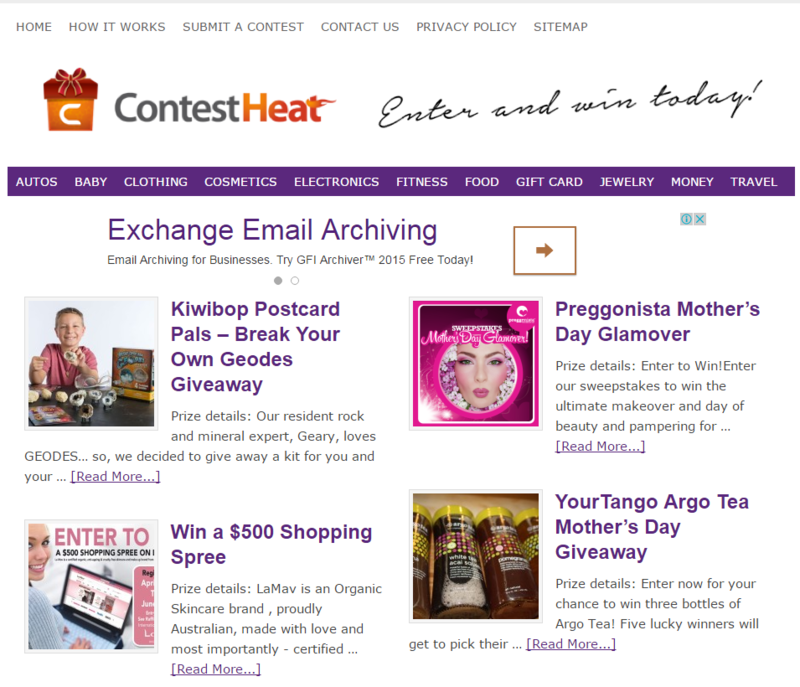 Contest Heat is a free resource for online contests, sweepstakes and giveaways for US Citizens! 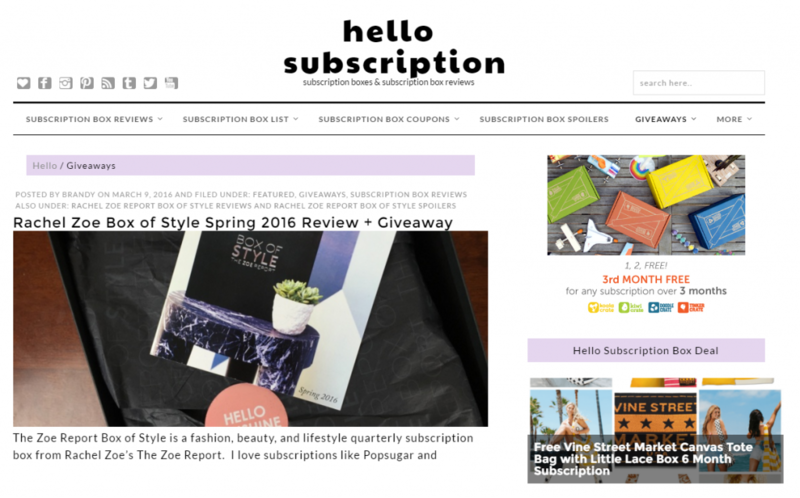 Hello Subscription features giveaways that are related to only subscription. 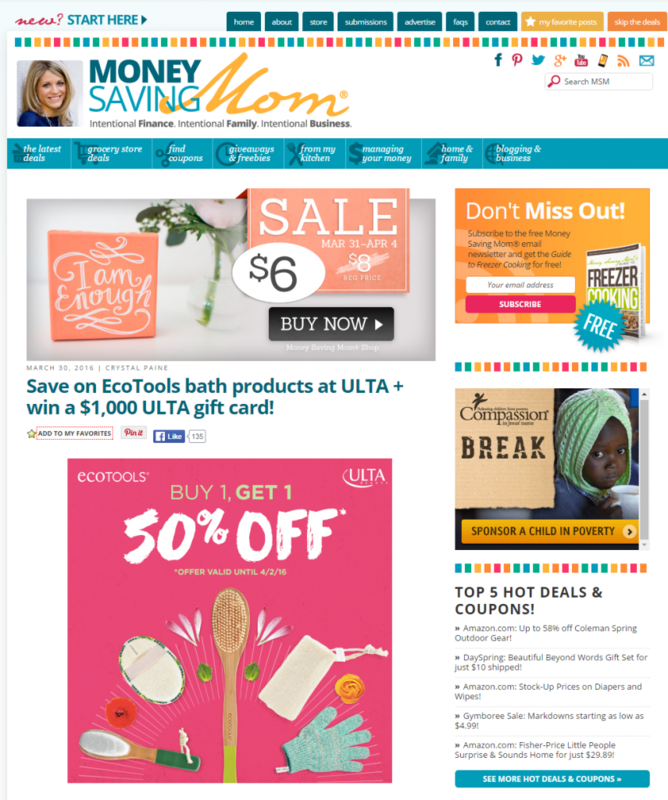 Money Saving Mom is another blog that features giveaways targeted for females and moms. Contest Listing provides a free platform to share and promote your contests and giveaways to thousands of daily visitors. 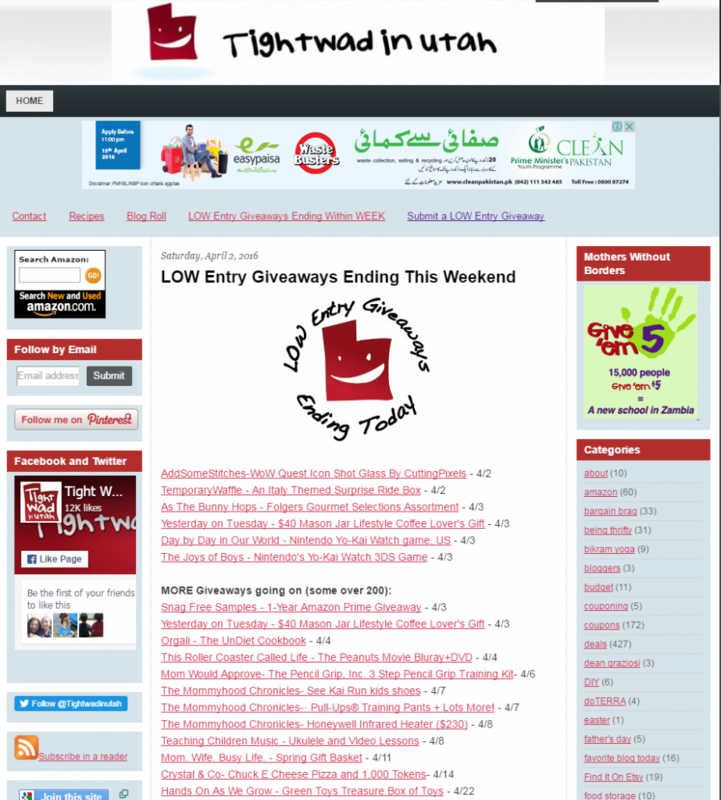 Tight Wad in Utah features a list of low-entry giveaways viewed by thousands of visitors and subscribers on their website. Family Focus Blog features giveaways and links from around the internet that are focused around personal or family use. 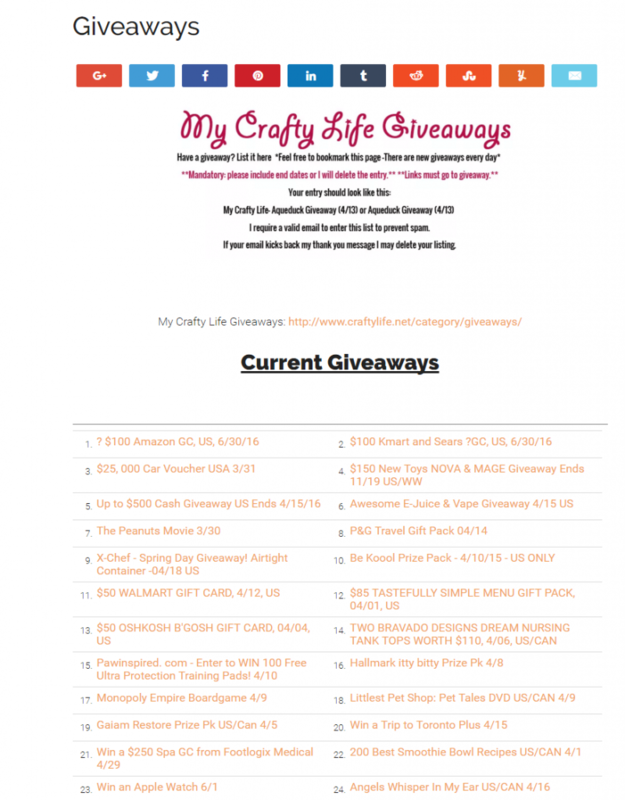 Crafty Life enables you to easily add your giveaway in their giveaway list, viewed by thousands of their website visitors and followers. There you have it – 100! places to list and promote your content. Listing your contests and giveaways will not only boost your contests but also gives your stream of new leads / participants from places you can’t imagine. So what are you waiting for. Start listing your contests and giveaways now!